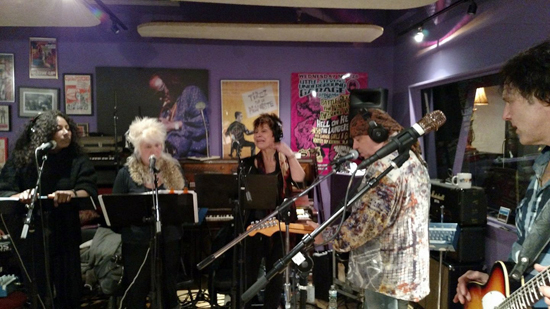 Eddie Brigati: After The Rascals, now playing at New York City's The Cutting Room, is produced and directed by Steven Van Zandt for Renegade Theatre, the live theater production company he founded with Maureen Van Zandt. It reunites the Van Zandts with Brigati after the success of The Rascals: Once Upon a Dream, the "BioConcert" project that eventually hit Broadway, bringing the highly influential Rock and Roll Hall of Famers back together almost 50 years after their formation and telling their story to fans old and new. In this new cabaret-style live show, Brigati, whose voice has aged very well, performs in a tux with a fine combo led by musical director (and former Disciple of Soul) Mark Alexander. The repertoire is an interesting set of new takes on pop, soul and folk classics originally recorded by The Rascals and others, Broadway showtunes ("all chosen by our co-producer Maureen Van Zandt," says Brigati) and American Songbook classics, including a Sinatra medley. Brigati also performs a new song that Steven Van Zandt wrote especially for his planned Broadway show to be built around Brigati's life and music. 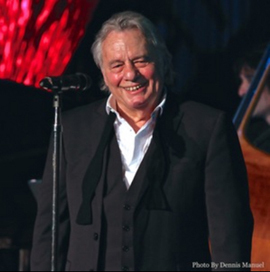 If you're looking to spend a pleasant spring evening in the Big Apple, in a beautiful venue that recalls the great supper clubs of the past (including some tasty food and drink,) you should catch Eddie Brigati: After The Rascals at The Cutting Room. Click here to purchase tickets for the next scheduled performance on Monday, May 1. Stevie also serves as the narrator for the newly released documentary film BANG! The Bert Berns Story. A decade in the making, the film brilliantly tells the little-known and fascinating history behind one of our greatest songwriters and producers. In the process, it also explores the darker aspects of how U.S.-based popular music got made during the latter half of the 20th century. The narration, delivered by Van Zandt in the same style of the great mini-music-lessons we regularly hear from him as founder and chief proprietor of the Underground Garage, was adapted by Joel Selvin from his Here Comes the Night biography. Among those interviewed for the documentary were Solomon Burke, Cissy Houston, Ronald Isley, Ben E. King, Paul McCartney, Van Morrison, and Keith Richards. Besides Steven's involvement with the film, there are a few other interesting Springsteen/Berns connections worth noting. "Twist and Shout," one of Bert Berns' greatest songs, was the first rock 'n' roll song that Bruce Springsteen learned to play on guitar. Berns' "Hang On Sloopy" writing partner, Wes Farrell, later wrote some Partridge Family material with former Springsteen managers Mike Appel and Jim Cretecos. And close Berns associate Brooks Arthur, founder of 914 Sound Studios, where Springsteen's first two albums and Born to Run's title track were recorded, co-produced the film. Arthur also is extensively interviewed in it and provided important source material from his personal archives. BANG! The Bert Berns Story just began its run at New York City's IFC Center and will screen throughout the U.S. this spring. Click here to find a screening near you. Oh, and then there's Stevie's involvement with Rumble: The Indians Who Rocked the World (coming this summer) and the ongoing campaign to finally get Link Wray into the Rock and Roll Hall of Fame, but more on that later. Unlike Little Steven, we can't do everything at once. Here at Backstreet Records we've got plenty of bookshelves too... and we happily join our fellow indies to celebrate the day. Save 15% on all books in stock with coupon code BOSSBOOKS, through the weekend. 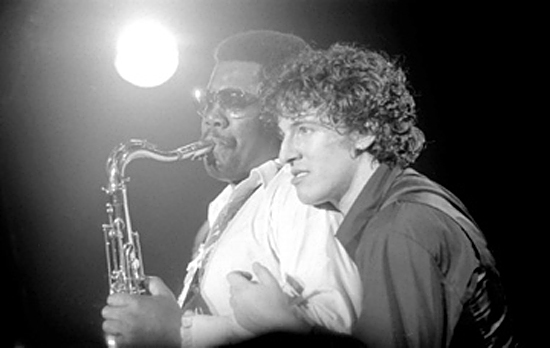 As of this afternoon, the new Indiegogo campaign for Clarence Clemons: Who Do I Think I Am? has more than $12,000 pledged from 100 backers to help with the completion of the documentary. We checked in with producer Joe Amodei and director Nick Mead, who tell us, "The campaign is up and running and a lot of good things are starting to happen. It's still early and we have a long way to go to hit our goal of raising the funds to finish this film. Thanks to everyone who has gotten involved so far. There are a lot of Clarence Clemons fans out there!" 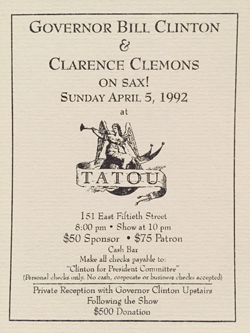 Rare printed invitation to Clarence & "Governor Bill Clinton" performance together on saxophones, in New York City on April 5, 1992. This event was a fundraiser for the "Clinton For President Committee." Many other general-public perks are also available to support the film, beginning as low as $15 for early access to a stream of the film and $25 for an advance download. See the full Indiegogo campaign here. It was 46 years in the making, but Garry Tallent's first show at center stage was well worth the wait. Stepping to the microphone at the Wildey Theater in Edwardsville, Illinois, Tallent's first words were, "I intend to have a lot of fun." Over the next 90 minutes and 19 songs, he and his band — and the crowd — did just that. 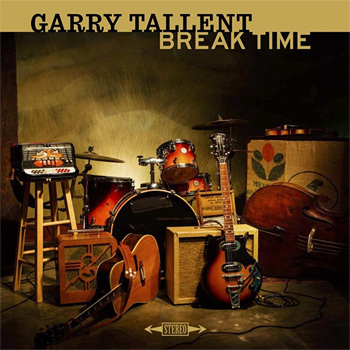 Normally on stage with the E Street Band, Garry is happy to stand in the shadows, laying down a fantastic groove for hours at time, but on Friday night, as he opened his Break Time tour, Tallent was the frontman for an incredible band in their own right. The Break Time cover art features many different instruments,and it's an apt representation of the wealth of musical styles featured on the album and in concert: early rock 'n' roll, rockabilly, Cajun zydeco, surf rock, Americana and a touch of gospel. Fans were treated to all but one song from the album, in addition to cover versions of some of Tallent's heroes including Chuck Berry, Carl Perkins, Levon Helm, and Sonny Burgess. Garry smiled, danced, led the band, and laid down some incredible guitar work throughout the show. Opening with "Bayou Love," Tallent moved into "Ants in Her Pants" and then "Ooh La La," which sounds and plays as a perfect follow up to Chuck Berry's "You Never Can Tell." Tallent played lead guitar with a great solo break over a driving beat and finished with the clarification, "That's all the French I know." Next was "If I Could I Would," a song by original Sun Studio recording artist Sonny Burgess, taken from the eponymous album Tallent produced for Burgess in 1996. A definite highlight was "Hillbilly Train," written by bassist Mark Winchester, who came to the front of the stage and took over lead vocals at Tallent's request. The band hammered away in a rockabilly arrangement with Garry nodding his head at each player who took a turn highlighting their skills. Tallent's band was incredible from start to finish, hotter than a two-dollar pistol and featuring many musicians who appear on the album. The band channeled the early Sun Studio sounds of Scotty Moore, Bill Black, Jerry Lee Lewis, Carl Perkins and many others. 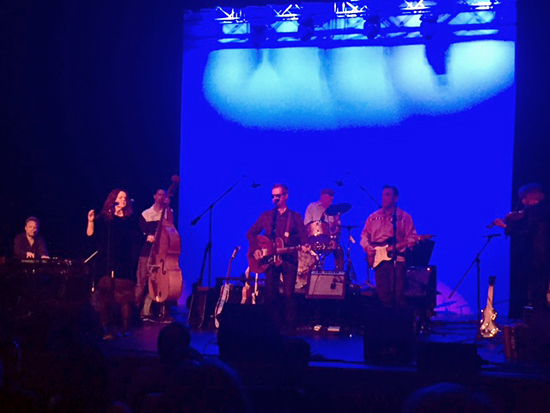 With Jimmy Lester on drums; Winchester on standup bass; Eddie Angel on rhythm guitar; Fats Kaplan on violin, banjo, guitar, lap steel, and accordion; Kevin McKendree on keyboards; and vocalist Kristi Rose, the band played with a high level of fluidity and cohesiveness, surprising considering this was their first concert together. Rose sang lead on "Rock Boppin' Baby," a Collins Kids cover from 1957 and a low, sultry burner like Peggy Lee's "Fever." She continued with her superlative, soaring vocals on "Promise to My Heart," telling the crowd, "When I first heard the song, I wanted to ask Garry if I could sing on it. I thought that might be presumptuous, but I did it anyway." And Tallent countered, "She does a much better job than I did. And I get to do my best Duane Eddy part. I tried to get Duane to go on tour but he couldn't." Continuing with his tribute to early rockers, Tallent asked, "Any Carl Perkins fans out there? I got to work with him a few times, and he always had those blue suede shoes. This was his follow-up to 'Blue Suede Shoes,' and I'm glad this didn't become a hit." He started into "Pink Pedal Pushers," which has the feel of The Coasters' "Three Cool Cats" in arrangement and vocals. Introducing "Move to Japan," Tallent said, "Here's one that Levon Helm, the singer from The Band, wrote. I got to know him, and here's one of his that's not well known." "Today's the Day" featured silky smooth vocals and harmonies like the Jordanaires, Elvis Presley's original backing vocal quartet, which isn't an accident — the Sons of the Jordanaires guested on the album version. An unnamed instrumental featured keyboardist McKendree channeling Jerry Lee Lewis, with his right hand pounding away on the keys, a barnburner of a song and performance. Edwardsville is 20 miles east of St. Louis on the Illinois side, and Tallent paid respect to the recently deceased father of rock 'n' roll: "Being so close to St. Louie, we've got to play a Chuck Berry song. Chuck was known to be difficult, but he was always sweet to me for some reason. He was the inventor of rock 'n' roll, and his legacy is huge. Here's one of his that isn't well known." The band launched into Berry's "Brown Eyed Handsome Man," with Tallent and Angel laying down some perfect Chuck Berry guitar work as the band finished in a flourish with a "Tequila"-flavored beat. Continuing on with his nod to Berry, Tallent introduced "How Come You Do Me Like That" from Break Time: "Here's my tribute to Chuck, with Chuck in mind, obviously." The band closed the show with "Charlene," an ode to Buddy Holly's "Not Fade Away" with a driving Bo Diddley beat, in great form and fashion. With a supportive and respectful crowd — no one shouted out "Thunder Road" requests or asked Garry to play the tuba — it was a stellar night, and it's only the start. Catch the tour if it comes near you. See the full itinerary at garrytallent.com. 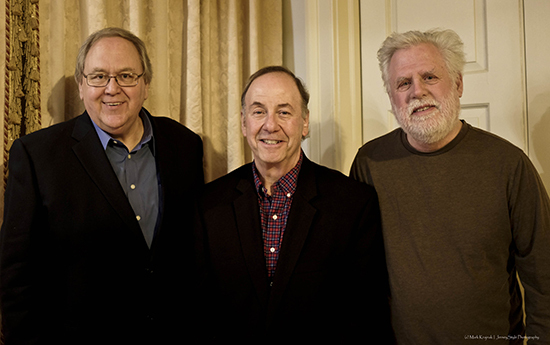 Earlier this month, radio greats Tom Cunningham and David Dye appeared in conversation in Princeton, NJ, for an event called Springsteen on the Radio. Photography great Frank Stefanko guested. Watch it all here, courtesy of the Morven Museum & Garden YouTube channel. We continue to mourn the passing of Jonathan Demme and remember his lasting impact, especially on the E Street universe. Here's one of the finest examples of Demme's greatness as a filmmaker, particularly when working with music and musicians. Demme's music video for the E Street Band version of "If I Should Fall Behind" was shot with a single camera in one unedited take during a Reunion Tour soundcheck in Philadelphia. It captures beautifully what it meant, and still means, to hear and see this song performed by people with bonds that not even death can break. Images of Clarence cooking breakfast for the band in their motor home; the mistake he made when going to interview Ringo Starr; how part of the Upstage ended up in his mother's garage: just some of the many subjects Max Weinberg touched on during his conversation with Bob Santelli on Saturday afternoon. 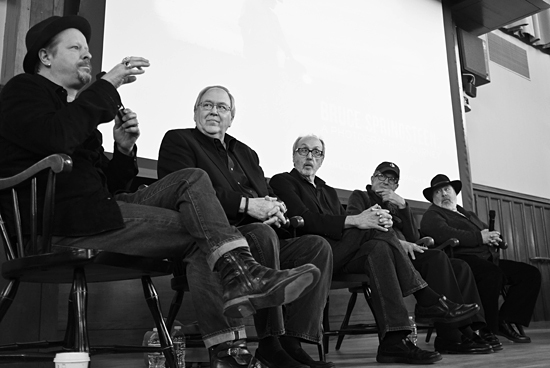 Opening the Asbury Park Music and Film Festival talk with the observation that this was a continuing conversation over the years, in the course of an hour, Santelli would guide Max through various memories and recollections of his 43 years in the E Street Band and his career as a drummer. Beginning by placing us in Rockland County, NY, in 1974, Max related how he and his band — one of his many pre-E Street projects at the time, including playing in the pit band in Godspell on Broadway — were living in Tappan, NY. "Which is right near Nyack, which is near Orangeburg and Blauvelt. Now, Blauvelt, New York plays a big part in Bruce's history. Has anyone ever seen that or heard the name Blauvelt?" Max asked, resulting in a crowd full of nodding heads. "Then you know that 914 Studios was located in Blauvelt. So one of the guys in the band, Jack Craft, piano player, he worked there as an assistant engineer. 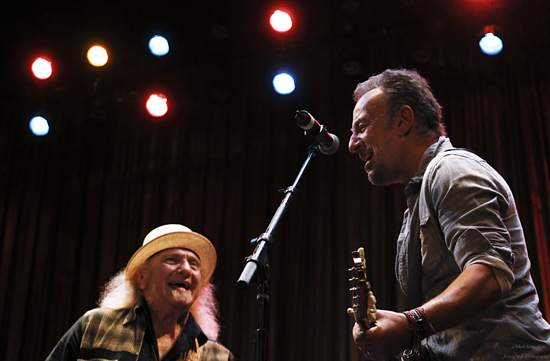 He came into rehearsal one day and said that he thinks he's gonna go join this guy Bruce Springsteen's band. I had no idea who Bruce Springsteen was. But we had a band. 'What do you mean you're joining some other guy's band?' In any case, he didn't get the gig. Then the other piano player auditioned as well. What's going on here? The band seems to be breaking up. Two weeks later one of the piano players... said to me, 'You know, Max, he's still looking for a drummer.' Really? So I said, 'Well, these guys auditioned…'" and he called the phone number. Max related how, during the audition, he was able to follow Bruce's performance cues to stop and start again, which got him the job — especially the latter. "This was a pretty obvious stop. So I stopped, and then there was a long pause. Then Bruce went like this... When he did that, I hit the snare drum. And out of all the guys that auditioned, I was the only guy who hit the snare drum. Because I had a lot of experience at that time playing behind dancers and strippers — I had a very varied background. I didn't write songs, so you have to take every job you can." He then shared that the reason for the aforementioned varied background was family economics. "When I was about ten, my parents' business started to go bad. It got worse and worse and worse.... By the time the Beatles came around, I already had been out working as a drummer. And working as a drummer, particularly in those days, you had to learn how to play everything. A little jazz, a little polka, a little Dixieland, rock, which was my first love, of course. I would never turn down a job because it wasn't what I wanted to play." Max's bands rehearsed in his parents' house, and although he never played at the Upstage, part of the Upstage ended up in his parents' garage. At the end of the club's life, there was an auction of the physical property, and one of his bandmates brought him along to help schlep the gear home. "We bought two Leslie speakers for $100 each, which are for the organ. They were auctioning off the speakers that were on the side of the stage, which were about 12 feet tall. They were mounted in plywood that is, I remember, painted black, and it had some sort of design on it. We got those for $50 each, which was a lot of money to us. The catch was we had to help them... un-nail them from the wall. Right? So we get them off, and we tie them to Kevin's VW bus. We drive back up the parkway with the two Leslies, me and Kevin and the speakers. Those speakers, we installed them in our practice space. This was in 1970. My mother lived in that house until 1986, 16 years. So someone bought it. I'm assuming those speakers are still in the garage." His parents' house would figure later in the discussion during the audience Q&A, when Cathy, a former neighbor, reminded Max of the neighborhood petition that circulated to try to stop his bands from rehearsing. In response, Max related the story of the time the band dropped him off at his parents' house after a gig, and their reaction. "Now, it was Bruce, me, Clarence, Garry and Danny and Roy, and we're all crammed into the station wagon. They dropped me off at my parents' house, and I can remember Bruce looking at the house and looking at me, and he goes, 'You're a rich kid!' And I said, 'I don't think so.'" 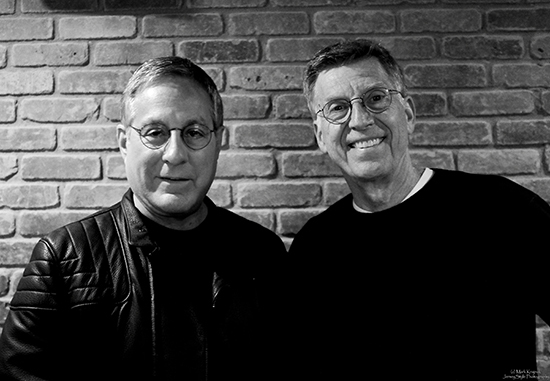 In addition to his many other credits, Bob Santelli was also the co-author of Max's 1984 book The Big Beat: Conversations With Rock's Great Drummers. He flipped the tables on Max briefly to relate the story about when the two of them went to London to interview Ringo Starr. Santelli: He's really nervous that we're gonna go meet Ringo and interview Ringo about drumming and everything. Santelli: At his house. So he says, "Put on your suit, Bob." I said, "Put on my suit? We're going to meet Ringo with our suits on?" It's, like, 100 degrees in London at the time. Back then not every hotel had air conditioning in London. We didn't. We're soaked with sweat, and he has us in suits in the taxi cab. He is just completely soaked. I'm completely soaked. Santelli: We got ties on and everything. We walk up to Ringo's house, we knock on the door, and he comes to the door and he looks at us. He says, "Why do you have those bloody suits on for?" Weinberg: It was like... I didn't have a plan B. But of course, given the setting, most of the audience wanted to hear more stories about the E Street Band. Max began by acknowledging his predecessors to the drum throne: "People sometimes ask me who are the most important drummers to me in my career. And without question the most important drummers in my career are Vini Lopez and Boom Carter.... If Boom hadn't made that turn, I would now be representing young, struggling musicians as a lawyer." Santelli asked Max to talk about his early days with the band, and how despite the success of Born to Run, the band was still struggling. "You know how bands start out on the road... we're driving in Garry's '65 Chevy," Max said. "Even then, even when I joined... Bruce was my roommate. We shared a room. That's right. The reason we're not sharing rooms after that is not in the book... That's for my book! Eventually we got a GMC motorhome. Clarence loved to cook.... We'd be driving along, and he'd be cooking. He was a serious cook and a great cook. He had all the accoutrements — the chef's hat, the apron — and we would do the dishes. I can remember waking up in the morning at the top of a mountain, where there was a rest stop, to the smell of Clarence making breakfast for everyone. Beautiful day, and you open up the curtains and there you are, and it's just us. It was the six of us." There was, however, a pecking order to the sleeping arrangements in the motor home. "We would sometimes sleep on the side of the road, 'cause it had these tables and, like any motor home, you could fold the tables down into beds. At that point, I was sleeping with Danny in the back. Roy and Garry slept on the table, which is slightly larger than a twin bed. Then there was a fold-down bunk, which of course The Boss got. Single bed. Then there was a long couch that Clarence sat on. There were some great, great unpublished pictures from that bus. I must say. Maybe someday, you never know." Jonathan Demme, the award-winning director, passed away this morning in New York City. He was 73. Demme is well known to Springsteen fans as the director of the film Philadephia and (along with his nephew, the late Ted Demme) the music video for "Streets of Philadelphia." Springsteen first met the director in 1985, when Demme directed the video for "Sun City." 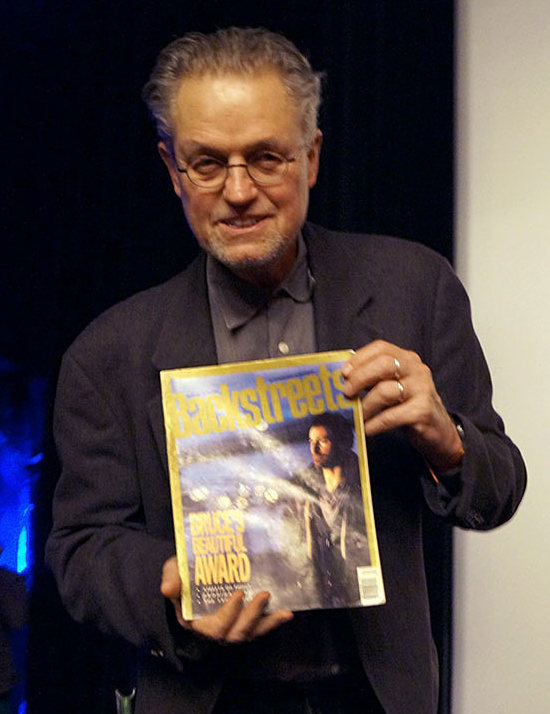 The video for "Streets of Philadelphia" would go on to win "Best Video From a Film" at the 1994 MTV Music Video Awards, and the song, which Demme asked Bruce to write, won the Academy Award for Best Original Song. In Born to Run, Bruce credits Demme with turning his focus towards writing on social issues again, out of which would come "The Ghost of Tom Joad." 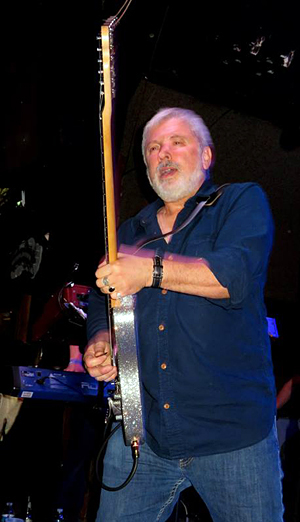 Demme would go on to work with Springsteen again in 1995 on the live video shot of "Murder Incorporated" for the Greatest Hits release, and he appears in the Blood Brothers documentary during that segment, instructing the crowd, gently checking to see if the band is ready, and nervously reminding Bruce to not change his clothes. It was such an unlikely occurrence that it seemed not only improbable but well nigh impossible that Bruce Springsteen would make an unannounced appearance on an Asbury Park stage on two successive nights. It was unlikely even in the mid-'80s, when he was out and about on what seemed like a weekly basis. Yet there he was up on the stage of the Paramount Theatre again on day three of the Asbury Park Music & Film Festival, a four-day music and film event that despite its intriguing and diverse lineups has struggled to find a foothold in the rapidly gentrifying Jersey Shore resort town. Unlike his appearance on Friday night, Bruce had executed a fairly stealth entrance, managing to keep his presence in the building a secret for most of the evening. But against all odds, there he was again, trademark Fender guitar in hand, joining his old friend at center stage for "It's Been a Long Time," the centerpiece of the 1991 Asbury Jukes Better Days album that reflects the long, shared history of Springsteen, Steven Van Zandt and Southside Johnny, Asbury Park's premier partners in crime. Even without the presence of Springsteen, Saturday night's headliner — the long-awaited return of Little Steven & the Disciples of Soul — would have been momentous. "It's nice to be back home," Van Zandt commented early in the evening. "We wanted to support the Asbury Park Music & Film Festival, which is why we're here. And we have a new album. Yeah," he smirked, "I only do this every 20 or 30 years." Indeed, more than a few folks in the audience had fond memories of packed, sweaty nights at the Stone Pony all those years ago. But this was no nostalgia trip — there was a new album to promote and a new generation of fans eager to hear it. The night's entertainment began with Local Legends, a short film profiling some of the lesser-known artists and musicians of Asbury's recent past that was more promotional than documentary. Still, it was nice to see fixtures like Lance Larson (Cahoots, Lord Gunner) on the big screen. After a brief intermission (during which the audience was treated to Sly & the Family Stone's Greatest Hits on the P.A.) the lights went down again, whereupon two strategically placed red police lights began flashing and corresponding police sirens blared. The curtain went up to reveal the Disciples of Soul 2017, featuring bandleader Marc Ribler on guitar and Jersey Shore fixture Ed Manion on baritone sax.Vamping for a minute or so, the band set the stage for the triumphant return to Asbury Park of Little Steven, frontman, who was greeted rapturously by the "hometown" crowd. The set began with the one-two punch of "Soulfire" (co-written by Van Zandt with Andres Bruus of the Danish band The Breakers) and "I'm Coming Back," another track from Better Days that had the audience singing along so loudly that Steven stepped back from the mic and let them do the last chorus. The set was a satisfying mixture of old and new songs, covers and originals, and the well-rehearsed Disciples — complete with three backup singer/dancers straight out of the Ike & Tina Revue — executed the diverse material with ease. As with the "preview" concert in Maryland last month, it was a show geared toward promoting the new Soulfire record, but with a few selections from Steven's 1989 Freedom No Compromise disc and plenty of hometown crowd-pleasers thrown in. Especially strong was the mid-set material, including the Asbury Jukes classics "Love on the Wrong Side of Town" (introduced as a "song me and Bruce wrote for Southside") and "I Played the Fool." "Until the Good is Gone" from the first Disciples record elicited a rousing call-and-response between audience and backup singers at the concluding "yeah, yeah, yeah" section of the song. There was also "Saint Valentine's Day," an outstanding track first appearing in the soundtrack for David Chase's criminally underappreciated 2012 film Not Fade Away, which sports a new arrangement with a killer horn riff. Also noteworthy was Steven's take on doo-wop, "The City Weeps Tonight," which he introduced as the song that was originally going to lead off his first solo record. Transforming his distinctive, somewhat nasal baritone into a croon eerily similar in quality to Hall of Famer "Little Anthony" Gourdine, Steven acquitted himself well — though he's certainly no Nicky Addeo. Another highlight of the evening was the band's percussive, jazzy cover of Bodie Chandler and Barry De Vorzon's "Down and Out in New York City." A "special treat" on this one was a guest shot on trombone by Fred Wesley of the J.B.'s. Steven proudly introduced Wesley — who co-wrote with James Brown many of the songs originally appearing with "Down and Out" on the soundtrack to 1973's Black Caesar — and recalled being a regular viewer of many of the blaxploitation films that made their way to Asbury Park, "just down the street from here." The set wound down with "Ride the Night Away" and "I Don't Want to Go Home," a couple more Steven-penned Jukes tunes that got the entire house up and dancing. The latter song, which like much of the more familiar material on the new record has been given a reworked arrangement, went somewhat unrecognized until the familiar "reach up and touch the sky" refrain, but it elicited the desired audience frenzy nonetheless. "I Don't Want to Go Home" holds a special place in Asbury Park music history. Besides being the first song Van Zandt wrote, it is more or less the de facto anthem for the legendary Stone Pony, where it has been played countless times onstage and over the P.A. To many fans, it evokes a certain nostalgia for sticky, beer-soaked nights at the Pony, which for many years was the one and only reason people showed up in Asbury Park at all. Much as the Upstage had been in the late 1960s, the Stone Pony was for a time a haven and a refuge for not just for "misfits" like Steven, Bruce, and Southside, but for fans who were drawn to it by the music they created; for these musicians and their fans alike, "I Don't Want to Go Home" is, in a way, the soundtrack of their youth. Closing out the main set were the Motown classic "Can I Get a Witness" (Marvin Gaye) and the lilting Disciples tune "Forever," which fans proceeded to belt out at full volume, prompting Steven to step back and listen in appreciation. For him and for many in attendance, it was another chapter in a lifetime of "only in Asbury Park" moments. 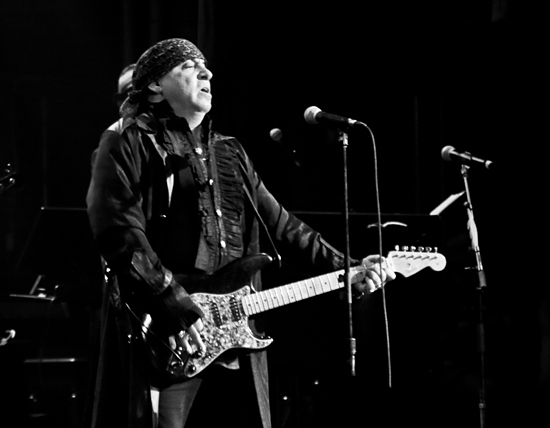 At the song's conclusion, Van Zandt motioned the band to the lip of the stage, where they graciously stood, beaming, to acknowledge the audience's appreciative applause. And then…and then... ["Along Came Jones," The Coasters, 1959] the band returned to their spots onstage, whereupon, after a slight delay, Steven called out, "Where's my brother from another mother?" A beaming Bruce Springsteen ambled out toward him from stage left. There were many songs in the set that Springsteen could've guested on, but really, there was only one that would do for this type of an evening: "It's Been a Long Time," the song that tells the story of Bruce, Steven and Southside and their misspent youth on the streets and in the bars of Asbury Park. It's difficult to overstate the emotional impact of the song on fans of the Jersey Shore music scene; like "I Don't Want to Go Home," it is, in a sense, every bit a part of their shared past as it is for its performers. On Saturday night, even if it were just Van Zandt by himself at the mic, the song would have packed a powerful punch. But with these two lifelong friends and music partners sharing the mic at center stage, the performance became one for the ages. 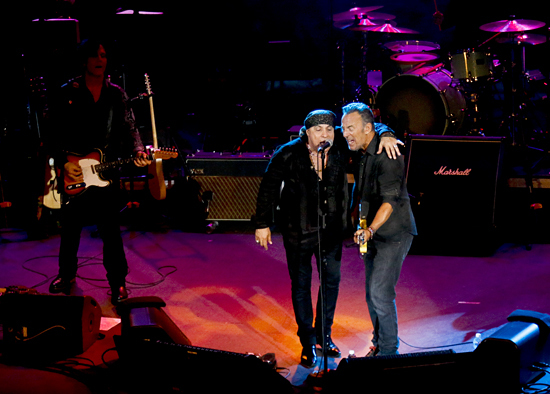 At the song's conclusion, a beaming Bruce leaned into the mic and shouted "Little Steven and the Disciples of Soul!" to an emotionally spent but exuberant audience, and like that, he and Steven exited at stage left and went off into the darkness. The audience stood and clamored for several moments, but to no avail; there would be no encore. Mr. Van Zandt and his new Disciples will be performing many shows in the coming months, but there will be few to match what happened at the Paramount Theatre. (APRIL 24, 2017 | RED BANK, NJ) Little Steven & The Disciples Of Soul will take the Basie stage for the first time ever when Citi Presents Little Steven’s Underground Garage at the Basie on Saturday, May 27, 2017 at 8pm. Tickets, priced between $39 and $89, go on sale this Friday, April 28 at noon via theBASIE.org, phone charge at 732.842.9000 and the Basie box office, located onsite at 99 Monmouth Street in Red Bank. All tickets will include a physical copy of Soulfire, Steven Van Zandt’s first solo album in nearly two decades. Citi cardmembers and Count Basie Theatre members will have first access to tickets, including $150 VIP tickets which include a pre-show meet and greet and photograph with Van Zandt, and a signed copy of Soulfire. "The Basie originally was my local theater growing up, where I saw A Hard Day's Night, The Nutty Professor, and Bye Bye Birdie" Van Zandt says. "Now it's one of my favorite venues." "Maureen and I were honored to be asked to be on the board, and help with the Basie's transformation into a performing arts and education center, which will include the first Little Steven's Underground Garage club. Citi is our corporate partner and their enthusiasm has been consistently inspiring. It's the perfect place for our Soulfire release party, which will probably be our only show in the U.S. until the fall." 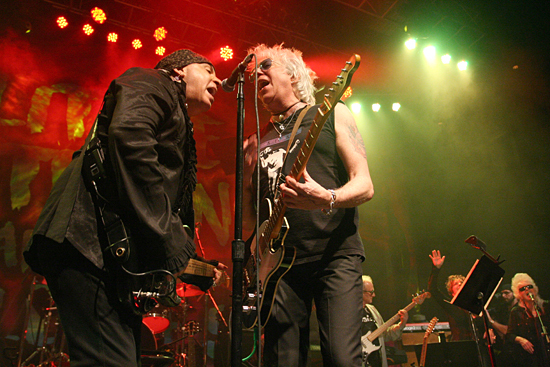 Friday night, a sold-out Paramount Theatre bore witness not just to the world premiere of Just Before the Dawn: Riot, Redemption, Rock 'n' Roll, but the long-awaited onstage reunion of many of the key figures in the history of Asbury Park's legendary Upstage club. While many of the musicians in attendance have appeared onstage together in various capacities over the years — many still live in the area — such gatherings have become increasingly rare. 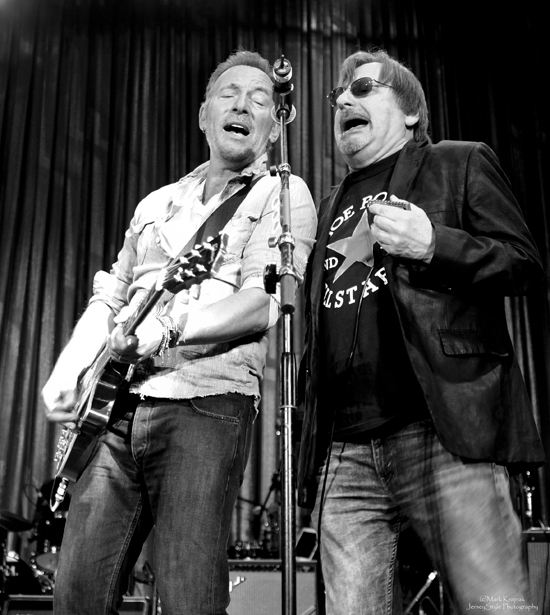 And the appearance of Asbury's unofficial "holy trinity" of Southside Johnny Lyon, Steven Van Zandt, and a surprise unbilled Bruce onstage together is also not something even longtime area residents have seen often. Yet, here they were, gathered in celebration of their unique shared history in the short-lived venue on Cookman Avenue. As per usual for film premieres, many people associated with the film were in attendance for the Asbury Park Music and Film Festival event. The documentary itself was well-received, as the audience greeted the appearance of familiar figures onscreen with warm applause. It's a fairly straightforward doc that employs all the standard techniques — archival film footage, candid interviews, voice-over narration — and audiences looking for a brief history of a familiar place and time with some great music will come away satisfied. Entertaining as Just Before the Dawn is, however, it barely scratches the surface of its subject. The history of the Upstage and the larger story of Asbury Park's rise and fall are vast and complex topics that don't easily lend themselves to the 90-minute documentary format. Historians like Daniel Wolff (Fourth of July, Asbury Park) and Charles and Margaret Horner (Classic Urban Harmony) have been wise to explore this complicated history not by being all-inclusive, but by honing on particular aspects of the story — a key theme or genre, a particular series of events. The story of Asbury Park in many ways is a story of America in microcosm, a conundrum that demands a long-form, multi-episode format. Unfortunately, much of the tale still waits to be told. Taking in the film, sitting a few rows back from the screen in the darkened Paramount Theatre, must have been a déjà vu moment for Bruce and Steven. The self-described "freaks and misfits" who had once watched Abbott & Costello movies here were in the house for the first portion of the evening's entertainment before heading backstage to prepare for the musical portion of the program. Their appearance onstage a few minutes after the intermission was no great surprise to many in attendance. Indeed, no small number of tickets were snatched up in the hours just prior to the event, as word filtered out that a Springsteen appearance was in the offing. Nonetheless, a thrilled audience leapt to its feet when the curtain drew back to reveal Little Steven and his new Disciples lineup augmented by a certain Freehold native on Gibson guitar and, to his left, former local whiz kid David Sancious and another local bandleader by the name of Southside Johnny. Southside burst into a Jukes-esque, horn-drenched "Blues is My Business," and the night was off and running on all eight cylinders. "The Upstage was our university, and Little Richard, Bo Diddley, and this guy were our teachers," said Steven, leading his band into a rousing version of Chuck Berry's "Bye Bye Johnny." With Bruce taking the final verse, it was a real throwback to their days of late-night club jams. After the Berry tribute, Steven and much of his band departed, leaving Southside (joined by Jukes bassist John Conte and ex-Jukes drummer Joe Bellia) at the front mic to belt a cover of B.B. King's "Got My Mojo Workin'" while Bruce wailed away on guitar. This was followed by a rousing rendition of The Band's "Up on Cripple Creek" (last performed by Bruce at the Stone Pony with Levon Helm in 1987). Dressed in work shirt and jeans, an unassuming Bruce hung back from the center mic for a good portion of the show. On a night celebrating the communal spirit of the Upstage, the frontman role was shared by many, with Asbury Jukes keyboardist and official ringleader Jeff Kazee somehow managing to coordinate the comings and goings of an endless array of musicians and instruments without any apparent mishaps. The next segment was led by the Upstage Jam Band — a who's who of Asbury Park music lore, including the likes of Ernest "Boom" Carter, Vini Lopez, Paul Whistler [above], Ricky DeSarno and Billy Ryan — who played a bluesy set of 60's-era covers like "Carol"/"Little Queenie" and Cream's "Strange Brew." Local doo-wop legend Nicky Addeo then came on to perform a solo version of Sam Cooke's "A Change is Gonna Come," accompanied on keys by Kazee, and guitarist Marc Ribler (Steven's new bandleader) took the helm for covers of Jimi Hendrix's "Voodoo Chile (Slight Return)" and Buddy Holly's "Not Fade Away," ably assisted on the latter by Danny Clinch on harp. The Lakehouse Junior Pros — an enterprising bunch of local tweens receiving rock 'n' roll instruction at the performance space/studio on Lake Avenue — followed, performing "The Hours Before Dawn," the tune they showcased in the film. The Upstage Jam Band returned with Messrs. Springsteen and Lyon in tow, backing the two of them as Bruce took lead vocals on a version of Little Richard's "Lucille" punctuated by DeSarno and Ryan guitar solos. Bruce calling for Sancious to play the Hammond B-3 was priceless; "When I first saw him, he was playing the organ," he commented afterward. Bruce and Southside duetted a la Sam & Dave on Chris Kenner's New Orleans chestnut "Something You Got"; Springtseen was really enjoying himself on this material, and it's a shame audiences don't hear it more often. 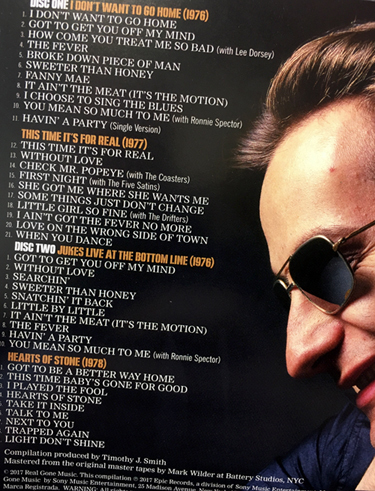 Of note here was a rare full-band version of the Bruce Springsteen Band-era tune "Ballad of Jesse James," officially released on last year's Chapter and Verse collection, with Vini Lopez on lead vocals. "Mad Dog Vini Lopez! He remembered all the words!" cracked Bruce at the song's conclusion. A scaled-back version of "The Fever" featured Southside on lead vocal, ably supported by Eddie Manion and Tommy LaBella on sax. "Here we are in Asbury Park, New Jersey, just where we were 75 years ago!" Southside cracked. Bruce left the stage briefly to make way for Jeff Kazee's lead vocal turn on "Fortunate Son" before reemerging to wind down the set. Southside stepped back to center mic to lead off the Jukes classic "I Don't Wanna Go Home" with a few bars of "Stand by Me," which was followed by a set-closing, all-hands-on-deck jam on yet another Chuck Berry medley, "Johnny B. Goode" into "Roll Over, Beethoven." 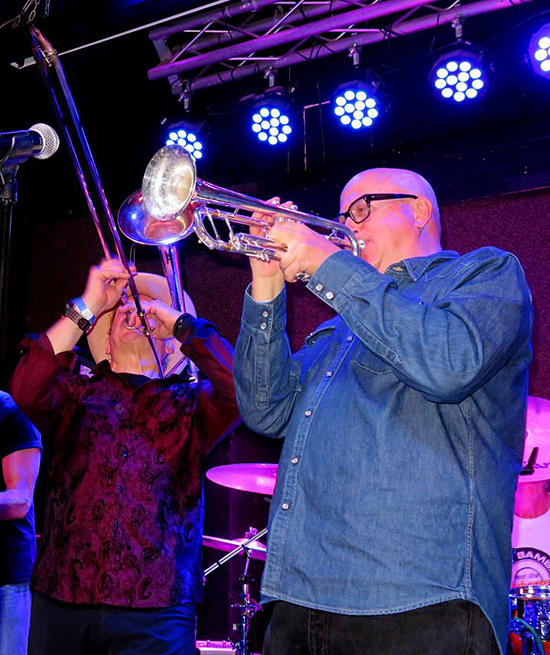 It was a rocking, satisfying night of music that reflected the true Upstage spirit, with familiar Asbury Park faces like LaBella and Marc Ribler mixed in with the talent-laden lineup of assorted Disciples, Upstagers and Jukes all generously sharing the limelight. 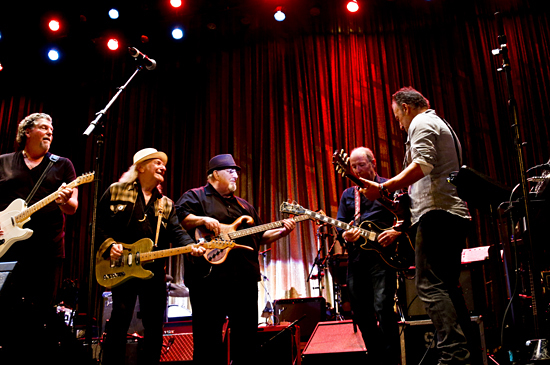 Even with Bruce and Southside doing the yeoman's share of leads, there was plenty of room for each musician to have a moment or two to shine, just as they had in the old days. Springsteen surprised APMFF crowds two nights in a row, following Friday night's Upstage Jam with an encore appearance at Little Steven's headlining show on Saturday. After Steven and the Disciples of Soul lit up the Paramount Theatre with their Soulfire, Stevie's "brother from another mother" helped bring it all home with "It's Been a Long Time" and "Bye Bye Johnny." Full report to come. A couple of views from last night at the Paramount Theatre in Asbury Park, where Bruce Springsteen joined Southside Johnny, David Sancious and the Upstage Club legends for the APMFF Upstage Jam. 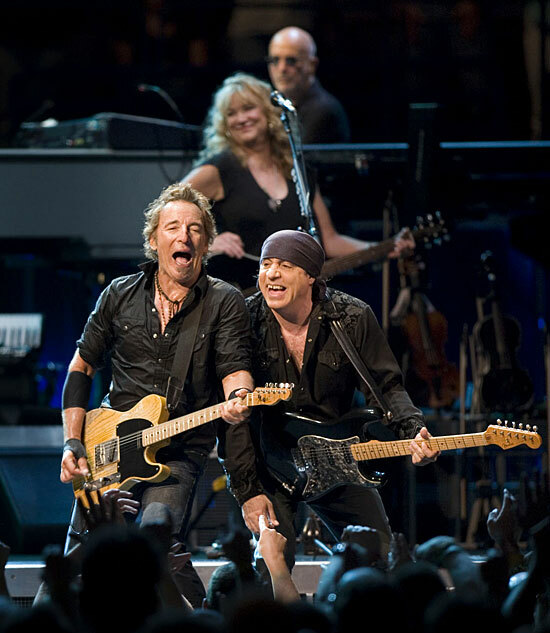 Thanks to Sammy Steinlight for the clips, who writes, "Little Steven Van Zandt also showed to jam with Springsteen and Southside for what was an epic Jersey rock night." Full report to come. One of our favorite holidays is upon us again, and maybe you'll already be out there looking to score the Hammersmith 4LP set tomorrow. But if you need another draw to get you to your local indie shop on Record Store Day, there's another release that'll be of interest to Backstreets readers: Live From E Street by Southside Johnny and the Asbury Jukes. 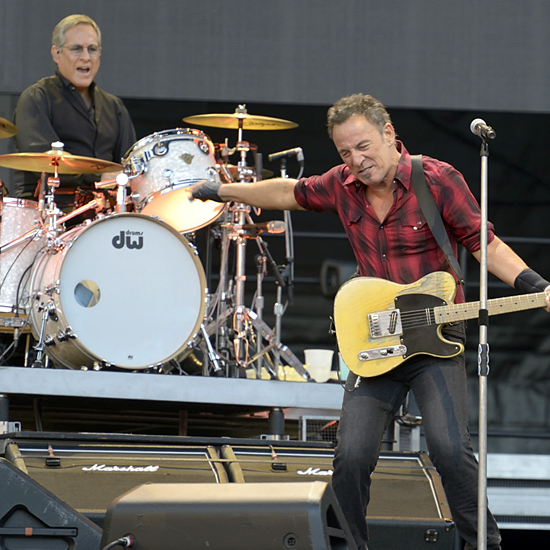 The 12-inch vinyl EP features live recordings of four Springsteen tunes, as performed by Southside and the Jukes at their February 2015 all-Bruce set at the Stone Pony: "Jack of All Trades," "Cover Me," "Murder Incorporated" and "Tenth Avenue Freeze-out." It's a new package for an EP that Southside's been selling at recent shows, Live From 10th Ave, with an altered title and new cover art. According to recordstoreday.com, the title has a limited run, with 1000 available in the U.S. Happy hunting! As always, if you're unable to find what you need on Record Store Day itself, there's a chance we'll be able to help you out with these titles after the fact. Stay tuned to our online shop in the coming weeks. But for tomorrow, we encourage you to patronize and support your local mom & pops — in our minds, every day should be Record Store Day... but that's certainly what the effort, now in its tenth year, is all about. With his first solo tour kicking off tonight, Garry Tallent guests on the latest episode of Enough About Me, a podcast hosted by Kirk Minihane of WEEI: "Kirk Minihane, Springsteen super fan, is joined by Garry W. Tallent, founding member of the E Street Band. Kirk and Garry talk about what it's like on tour with Bruce, how the band goes about selecting songs for the tour, Garry's projects away from the band, and Garry's upcoming solo tour that will bring him to the New England area." Listen to Enough About Me Episode 57 now at weei.com, or subscribe via iTunes. Tonight at the Paramount Theater in Asbury Park, a whole host of "Upsatge All Stars" will convene to jam following the premiere of Tom Jones' Upstage documentary. David Sancious will be there, Stevie Van Zandt, Vini Lopez [above], and Boom Carter, too — the roots of the E Street Band can be directly traced to the legendary Asbury club. Check how Bruce Springsteen remembers the band's "genesis point," when inducting them into the Rock and Roll Hall of Fame in 2014: "In the beginning, there was Mad Dog Vincent Lopez, standing in front of me, fresh out of jail, his head shaved, in the Mermaid Room of the Upstage club in Asbury Park." The Upstage is where Bruce met Danny Federici and a 16-year-old David Sancious, too. 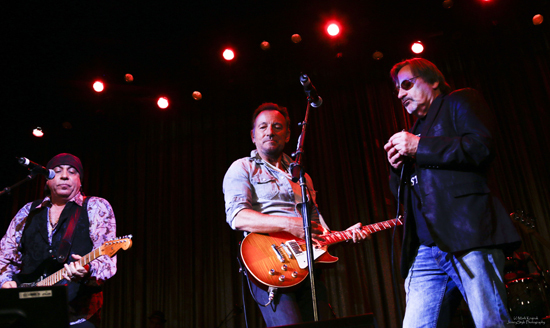 Garry Tallent and Southside Johnny? First spotted "when they dragged two chairs onto an empty dance floor as I plugged my guitar into the Upstage wall of sound." But it's not just E Street history that will be represented on stage tonight. 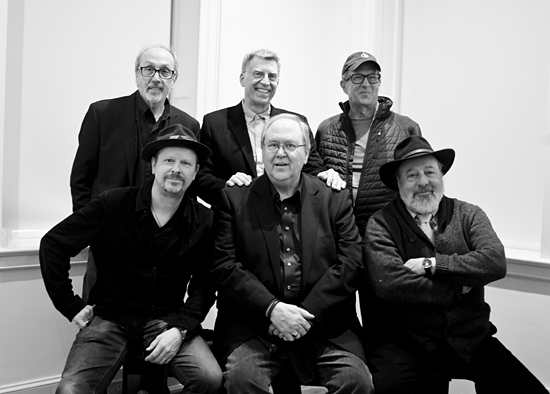 Led by longtime Asbury Juke Jeff Kazee, the assembled musicians will also include local heroes such as Sonny Kenn, Albee Tellone, Joe Petillo, Gerry Carboy, Billy Ryan, and more. Many of us — most of us — weren't around to experience the Upstage magic, either born too late or too far away. That includes photographer Mark Krajnak, who's "only" been able to steep himself in local music history in the post-E Street Reunion era. 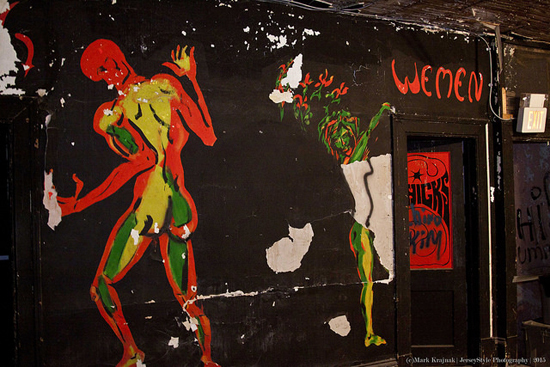 But he was lucky enough to be along when, in 2015, a small group got one of the last looks inside the old Upstage building, more than four decades after its heydey. The excusrsion was led by DJ Rich Russo and included Vini Lopez and Wild & Innocent percussionist Richard Blackwell [above], also perfoming tonight. Mark shot these photos for us and shares these thoughts. The history of rock 'n' roll at the Jersey Shore is like peeling an onion. There's layer after layer to work through, so much history as you learn more and more about who and what make up The Sound of Asbury Park. You find out that it's more than just a shuffle down E Street. 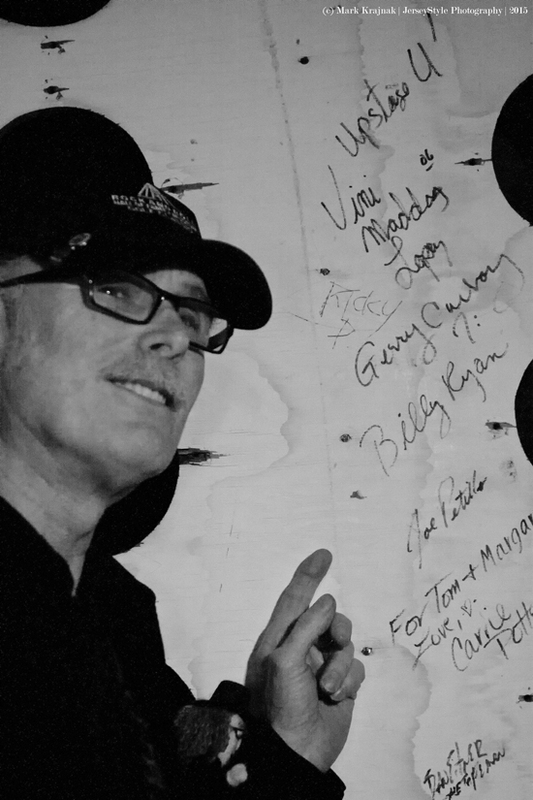 You find the contributions of musicians like Jeff Kazee, John Luraschi, Paul Whistler, and so many more — so many bands, people, and places that, woven all together, make up the fabric of Asbury Park. I had always known about The Stone Pony, of course. First time I was went there, though, was to see Leslie West of Mountain in 2002. Then I came to know of the other regal museums of music like The Fast Lane, Asbury Lanes, and The Saint. It wasn't until just a few years ago that I found out about the Upstage Club. Ironically, I found out about it just before it officially closed for good. It was a cloudy March 2015 evening when I gathered with several other music lovers in the lobby of a nondescript building at the corner of Bond and Cookman Avenues. I didn’t know what to expect. 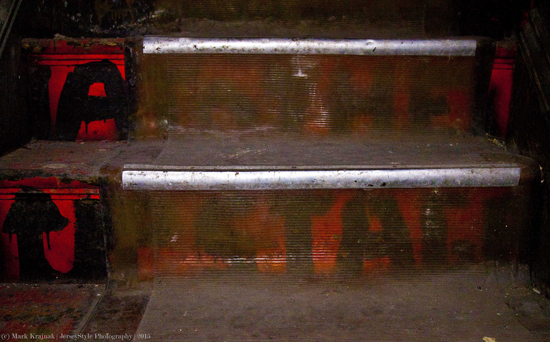 As we waited to go up the painted steps, I looked around. 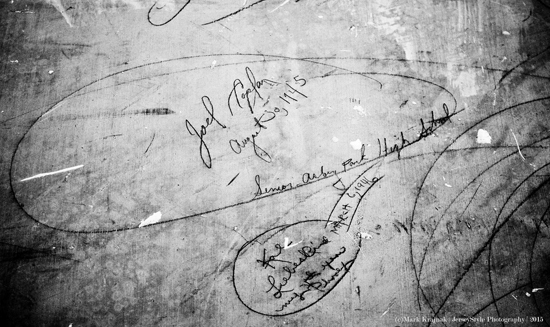 In one stairwell, I found ancient scribbles. Finally, we were allowed in. Up the dusty steps we climbed, not quite knowing what would be at the top. What we did find was… mystifying, at least to me. Weathered woods, peeling paint. Frankly, if I didn’t know better, I'd have thought we were in an old haunted house. The odd characters still holding paint on the wall — or that paint holding that wall up — gave that that impression as well. I had done my homework, though, and to be on this hallowed musical ground was indeed special. To be inside the Upstage after all these years was incredible. It was as if the walls retained all the music it had absorbed over the years. You could practically hear it. And you could almost hear the chants and the claps and the hoots and the hollers of those that had been there when this star burned bright. The musicians brought the jams and the people brought the fever. Best of all, you could feel the spirits of the Asbury Park sound in this room. It’s like standing in Independence Hall in Philadelphia... you could feel the history that happened there. It was the same for me standing in the Upstage. The history, the memories, the sounds, the music. It's all still there, reverberating on. Tom Jones' Just Before the Dawn, with its focus on Asbury Park and the music made there through troubled times, will have its world premiere at the Asbury Park Music and Film Festival tonight. I'm sure that, as people sit in the Paramount Theater and watch many memories will come flooding back to them. 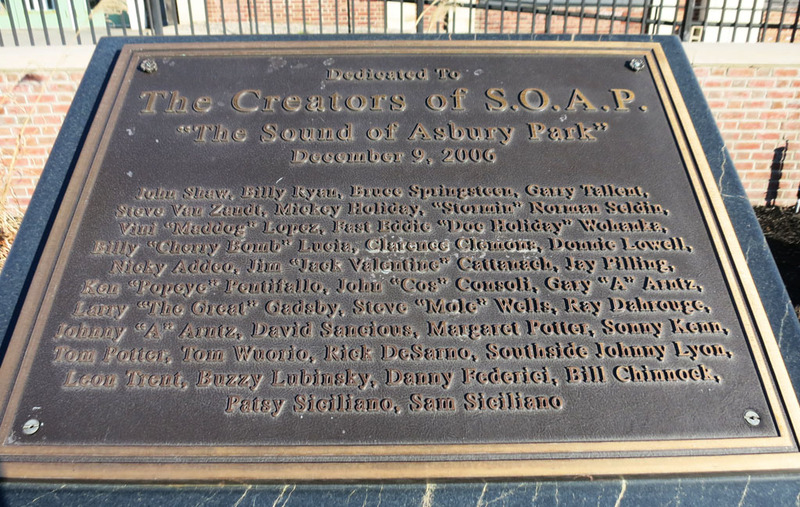 This documentary will serve as another monument to what was, and still is, the Sound of Asbury Park. They can rest assured, though — take it from a relative newcomer like me — that the Sound is alive and well, and the strong musical tradition of the Jersey Shore lives on. 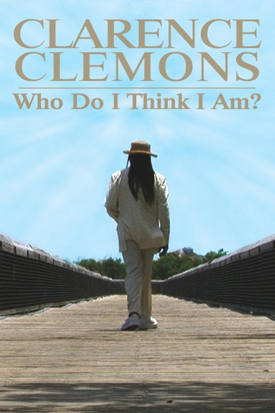 The Clarence Clemons documentary Who Do I Think I Am? has been in the works for years — we've reported plenty on it on this page, including the 2011 APMFF premiere of a cut that garnered a big standing ovation, with the Big Man himself there to see one of his dreams on the big screen. "Clarence had something beyond music that he wanted to share with the world," says the film's producer and President of Virgil Films, Joe Amodei. "And he had planned to do it through this documentary film, which he was working on up until his death." Director and friend Nick Mead spent six years filming with Clarence, beginning with a 2005 trip to China, capturing what became a spiritual quest and search for meaning that began on the Great Wall and continued until Clarence's death in 2011. Nick and Joe have been working to complete the project for a feature-length documentary, and fans can help bring it to fruition with a new Indiegogo campaign. Contributions will support funding of post-production, additional filming, music clearances and distribution. Amodei tells Backstreets, "It's been an incredibly long journey with this film. Over the years, Nick and I have started and stopped so many times. But we never lost faith. Especially Nick, who has hung in there like the best filmmakers do. If you had to reference a Springsteen song, you would definitely say 'One step up and two steps back.' But we never gave up, and we won’t until it's finished. We have a premiere set for late September/early October, and we plan on making that date." Clarence Clemons: Who Do I Think I Am? 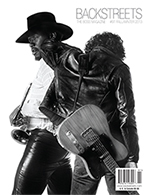 features interviews with President Bill Clinton; current and former E Street Band members Jake Clemons, Nils Lofgren and Vini Lopez; Danny Clinch,Joe Walsh, Willie Nile, Michael Narada Walden, Norman Selden, and many others. "I'm hoping we can get some additional E Street members to come out and join the film and share some memories of Clarence with the folks," Joe tells us. "Nils and Jake have been overly gracious with their time. But I also understand that folks are busy and march to their own schedules, so we’ll just have to wait and see how it all comes together. 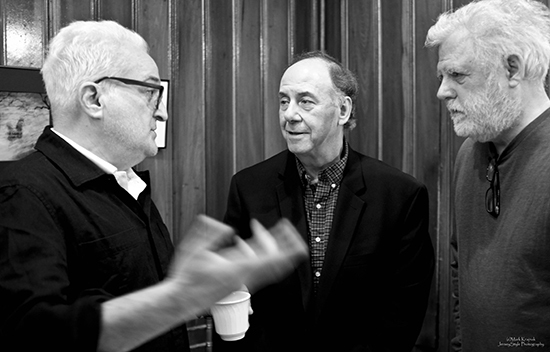 "At the end of the day Nick and I want to deliver the film that Clarence wanted you to see. In addition we’ve gathered some great friends and family members to talk about the Big Man and share those memories they had. I think he'll like what we have done. I hope so." Visit indiegogo.com for more on the film, the campaign, and to help realize the dream. 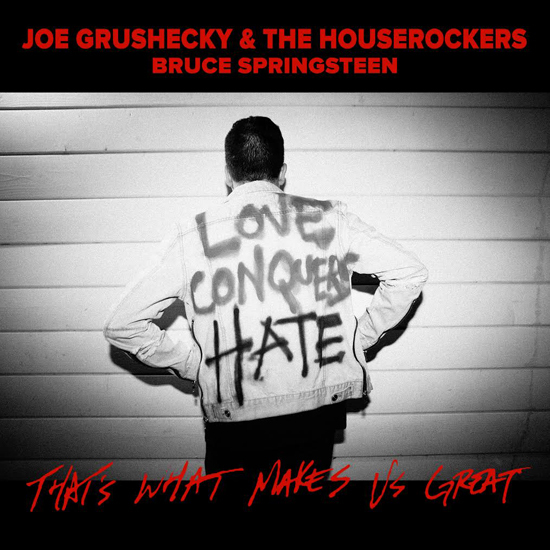 "That's What Makes Us Great" is a brand new single from Joe Grushecky & the Houserockers that features a locked-in Bruce Springsteen on vocals. This song, written solely by Grushecky, is a political call to arms for the Trump era, a rejection of anti-immigration efforts, "alternative facts," and hate. With Springsteen snarling his way through lyrics like, "Don't tell me a lie / and sell it as a fact / I've been down that road before / and I ain't going back," it's Bruce's first studio salvo in what earlier this year he called a "new American resistance." 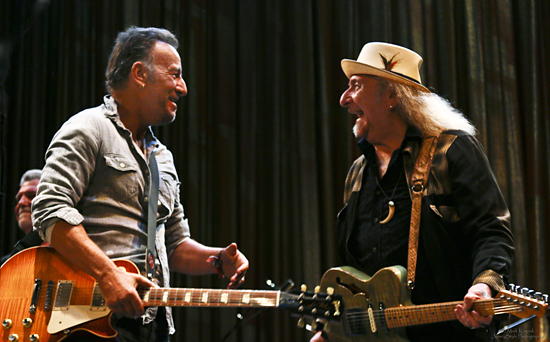 Grushecky and Springsteen have been studio collaborators going back to 1995. As Scott Mervis reports in the Pittsburgh Post-Gazette, Grushecky wrote the new song around the time of the inauguration in January; he was soon swapping files digitally between Pittsburgh and New Jersey to have his old friend give it "the Bruce treatment." Tom Cunningham, DJ and host of the Bruce Brunch radio show, also spoke with Grushecky and got an advance listen, telling Backstreets: "Joe said that this project came together quickly, which in this case is a boon — there's an urgency that's captured from start to finish. The Houserockers are in top form, and vocals are shared back and forth, with Bruce bringing serious heat on a couple of the song's most powerful verses." Grushecky talked with Mervis about what inspired the song: "[Trump] lost me the moment he started making fun of special needs people. How could a person like that be president of the United States? Regardless of all the other [stuff], that to me is appalling. I have special needs people in my family and in my neighborhood. I worked with special needs people my whole life and I was really offended by it." Cunningham, who plans to fire this one up on Sunday (the Bruce Brunch airs every Sunday at 9am, on 105.7 The Hawk at the Jersey Shore), adds: "I personally like that the premise of 'That's What Makes Us Great' is that it acknowledges that America already is and has been great. There's just enough earnest optimism and idealism too." "That's What Makes Us Great" debuts this morning on Sirius XMs E Street Radio and is available for purchase now as a digital download from joegrushecky.com. When Bruce Springsteen and the E Street Band hit the road for last year's River Tour, Garry Tallent had to put his own plans to tour behind his 2016 Break Time album on hold. Until now. 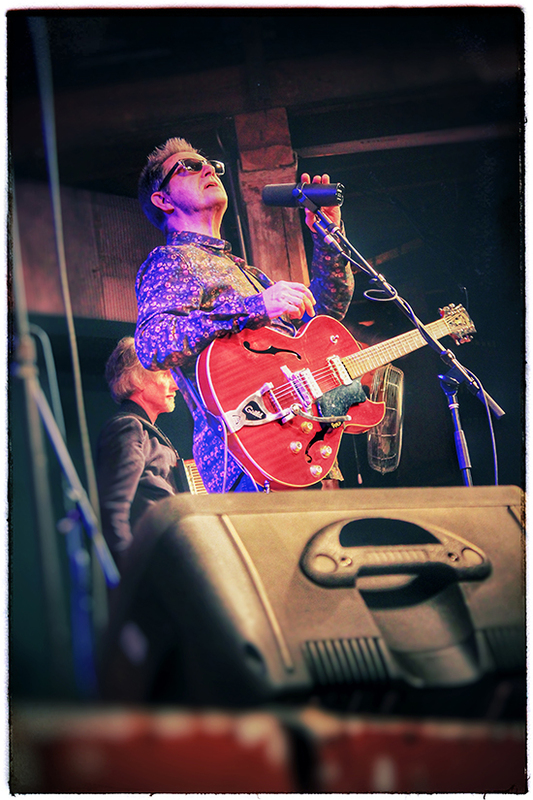 Finally, the world is ready for Garry W. Tallent, who embarks on his very first tour as frontman this week. The shows — currently, 14 U.S. dates in April and May followed by more in the U.K. and Ireland into June — begin this Friday in Edwardsville, IL. Billboard reports that Garry is "hoping to add more dates throughout the year as well. 'I was promised I could do this for the rest of the year, but I don't believe that,' Tallent says. 'There's some opportunities to do things in September, and I'm like, "Do I dare?" The album's been out a year, and it's not a major-label release or anything like that, so the good part is it's still new to a lot of people. I'm just taking one day at a time and we're gonna do these dates and take the temperature at that point." 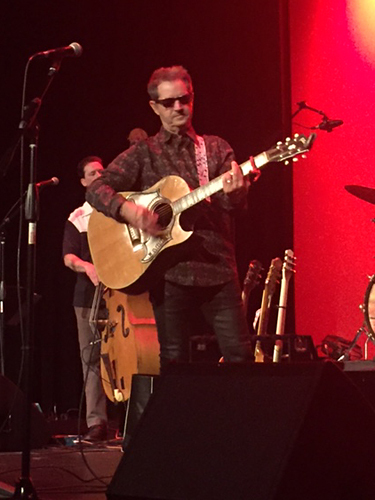 For more on Garry's plans, including working some Chuck Berry tunes into his set, read Gary Graff's interview for Billboard, "E Street Band Bassist Garry Tallent Gears Up for First Solo Tour, Talks Bruce Springsteen & Chuck Berry." Break Time, Garry's solo debut and what he described to Backstreets as "my tribute to the '50s.... my favorite era of music," is available from Backstreet Records on both vinyl and CD. 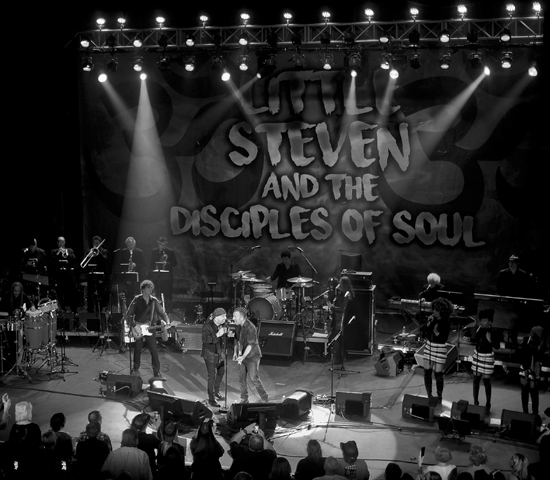 Due to unforeseen circumstances, the "Front and Center" taping of Little Steven and the Disciples of Soul on Friday, April 21 at the House of Independents has been cancelled. Tickets purchased through Ticket Web will automatically be refunded and tickets purchased at venue can be refunded on site. 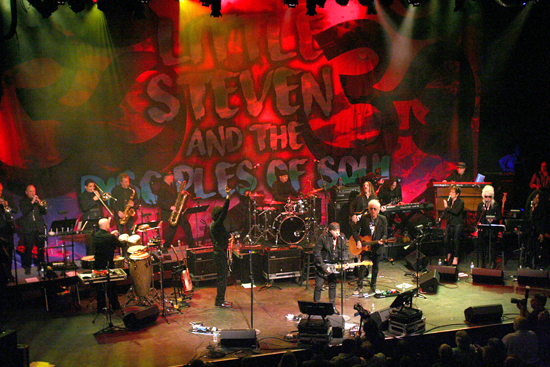 The Little Steven and the Disciples of Soul performance on Saturday, April 22 at The Paramount Theatre will go on as scheduled. Van Zandt will also take part in the Upstage Jam on Friday, April 21 following the premiere of the documentary Just Before the Dawn. Tickets are available for both performances by visiting www.apmff.com or at the Stony Pony box office. 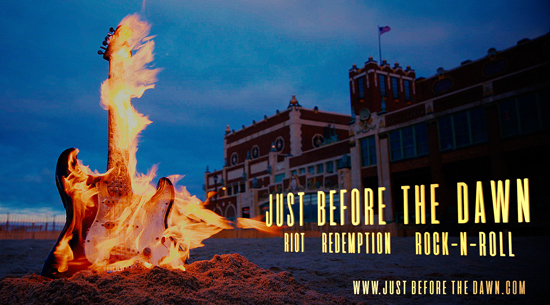 This Friday, April 21, the Asbury Park Music and Film Festival will present the premiere of Just Before the Dawn: Riot. Redemption. Rock 'n' Roll. The documentary, directed by Tom Jones, delves into the history of Asbury Park's Upstage club and its formative role in the careers of legendary Jersey Shore artists like Southside Johnny, Steven Van Zandt, Bruce Springsteen and others. 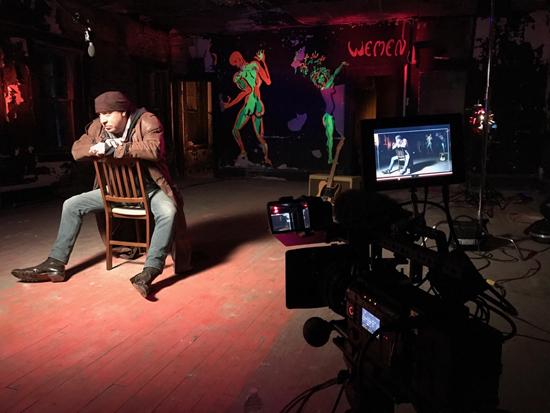 The project began as a narrative documentary about the Upstage scene but gradually became something more, as Jones used the club's history as the basis for a larger discussion about Asbury Park's history of segregation, the 1970 riots, and the turmoil, decay, and abandonment that followed. "When we started," Jones tells Backstreets, "we were going to make a history of the Upstage, but as we've gone on, it's become more about what Upstage did." 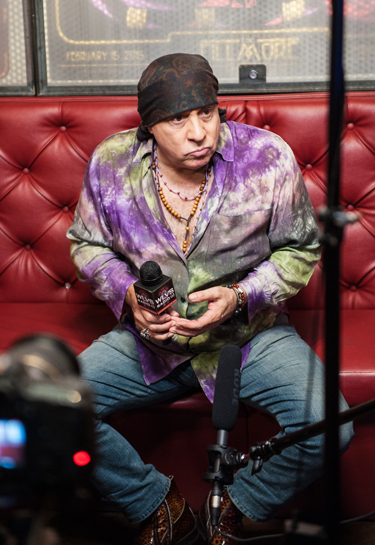 In the midst of upheaval, it became, as Steven Van Zandt recently commented in an interview with the Asbury Park Press, "a little sanctuary" for self-described "freaks and misfits" that gave rise to an internationally famous music scene, which continues to attract fans from all over the world. 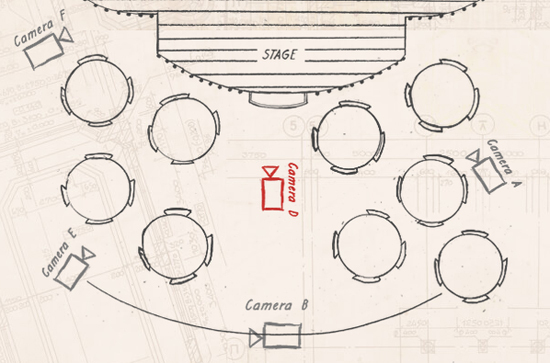 The Upstage originally came into being because Tom and Margaret Potter had a vision. "They didn't set out to do anything except create a place where musicians could hang out and play," says Jones, and great things happened "almost by mistake." Asbury Park was a haven for cover bands, and musicians seeking a creative outlet naturally gravitated to the hangout on Cookman Avenue because it was a place where they could meet up with their friends and play original music. And, as things heated up in the outside world, that was how it stayed. "People left their issues at the door," Jones insists. "Playing music was more important to them." According to news reports at the time, the issues raised by protestors were successfully addressed in the days following the unrest, as local politicians met with residents to discuss concerns and develop strategies that seemed to help calm things down. But there were larger issues in play, issues that would not be resolved by hiring a few kids in local businesses or building more public housing. So Asbury Park, like many of the country's urban centers, suffered a long slow decline. In Just Before the Dawn, Jones attempts to tell a more complex story of Asbury Park than that portrayed in the mainstream media, a tale with many villains and few heroes. He maintains that the city's decay was the result of a series of bad decisions by leaders at the state and local level, by their failure to assume responsibility for meeting the needs of residents. Filmgoers won't hear news reports or historians; instead, Jones presents "not people talking about the riots, but people who were in the riots," many of whom still live in the area. And he says he didn't really have a formal interview list for the doc: "We found the players by reporting the story." 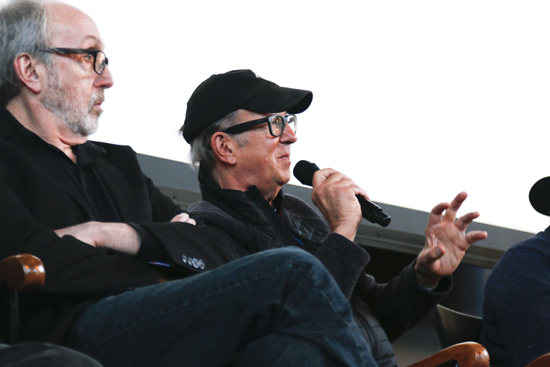 Jones [right] insists that the film is not a nostalgia piece but an attempt to weave Asbury Park music history into a larger narrative about the role that music and the arts in general have played in American society. What is it about music that brings people together, and what does the music scene in Asbury Park have to say to the world in 2017? The rapidly gentrifying Jersey Shore town now draws thousands of visitors to its restaurants and night spots, but change has been slow to come to Asbury Park's downtrodden West Side, which, despite the rise of its affluent waterfront area, is still beset by issues like chronic unemployment and a failing school system. Fortunately, in the past few years, organizations like the Asbury Park Music Foundation have attempted to preserve the city's rich cultural history while also fulfilling a dire need for music and arts instruction in the local community. The Foundation, which began as the small storefront Where Music Lives! museum and performance space on Cookman Avenue, was forced to relocate to its present location on Lake Avenue last year. Since the move, it has played an expanded role in Asbury Park, establishing a partnership with the Lakehouse Music Academy to develop programs for aspiring musicians of the city's underserved youth population, several of whom appear in Jones' film. The partnership, titled "Music Saved My Life," supports music instruction targeting underserved teens and young adults in the Asbury Park community through classes and workshops like the Hope Academy Charter School Music Program. 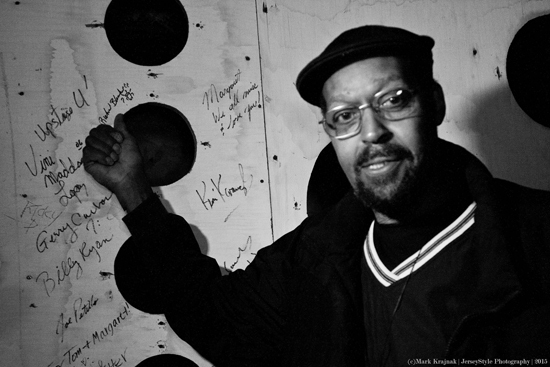 Jones' recent involvement in the field of conflict resolution has dovetailed both with the film project and with the burgeoning movement to employ music instruction as an entry point to larger exploration of social, political and cultural issues. Like Steve Van Zandt's TeachRock high school music curriculum, Jones hopes to develop a conflict resolution curriculum that would employ music instruction, and he sees the "Music Saved My Life" partnership as an important first step toward that goal. Tom Jones sees both his film and the history of Asbury Park in general as "stories of hope with some great musicians." And while it's not all "hearts and flowers," Jones insists that there is definitely something to be hopeful about in the once-blighted Jersey Shore town. Just Before the Dawn screens this Friday at the Paramount Theatre on the Asbury Park boardwalk. The premiere event will include a Q&A with Jones, as well as a musical performace: The Upstage Jam with the Upstage All Stars, Southside Johnny, and special guest Steven Van Zandt. Individual tickets range from $25 to $145 and are available through Ticketmaster. 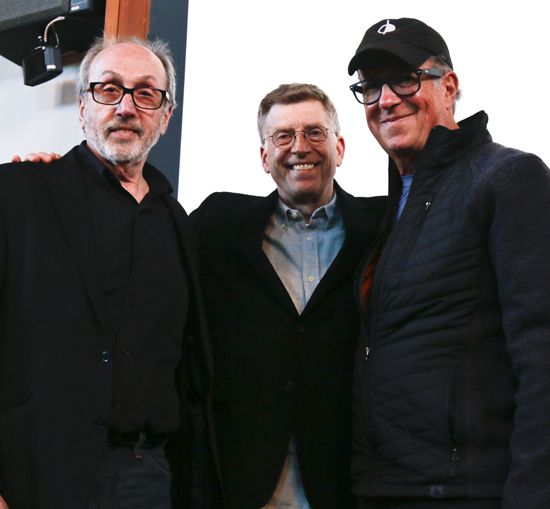 Proceeds from the Asbury Park Music and Film Festival benefit "Music Saved My Life." - April 17, 2017 - Lisa Iannucci reporting - images courtesy of Sammy Steinlight - Just Before the Dawn photograph by Will Miller Jr.
Today's official archival release manages several feats at once. 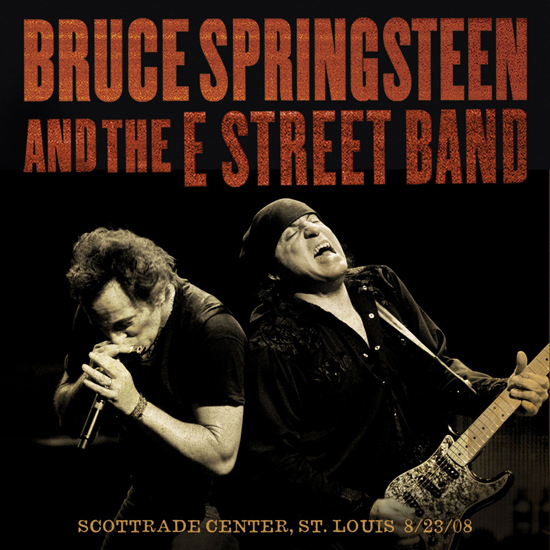 Scottrade Center, St. Louis 8/23/08 not only brings to fans one of the hands-down greatest E Street Band performances of the new millennium, and the Live Archive's first entry from the 2007-2008 Magic tour, it also tips a hat to the late, great Chuck Berry, born and raised in St. Louis, MO. When Berry died less than a month ago, Springsteen called him "rock's greatest practitioner, guitarist, and the greatest pure rock 'n' roll writer who ever lived. This is a tremendous loss of a giant for the ages." In Berry's hometown, including a cover of "Little Queenie," this is fittingly a show for the ages, too. Everyone knows part of the legend of Bruce Springsteen in concert is the epic length of his shows, often running three to even four hours. But a great Bruce show isn't merely about length, it is often about the unexpected. Since the early '70s, Springsteen setlists have changed night after night, distinguishing each performance and ultimately driving fans to seek live recordings of special shows. On the Magic tour, fans took it one step further, bringing song-request signs into the arena, the honoring of which became part of every show. Fan attempts to "stump the E Street Band" not only brought more elements of surprise to the show, seemingly delighting Springsteen in the process, they also inspired him to look back on his own history and dig out songs he hadn't touched in years. The heights Springsteen and the E Street Band reached as a result are on full display in this lauded performance from the final days of the Magic tour. The set is peppered with jaw-dropping additions, surprising the audience from the start with a cover of The Crystals' "Then She Kissed Me," played for the first time since the Born to Run tour, while later in the set "Mountain of Love" (originally performed by Harold Dorman as well as Johnny Rivers) also appears for the first time since 1975 (most famously on the oft-bootlegged February 5, 1975 Main Point radio broadcast). The setlist continues to unfold with still more surprise covers (a bit of "Not Fade Away" into "She's the One" hearkening back to the Darkness tour, Berry's "Little Queenie" in the encore) and original rarities ("Rendezvous," a full-band "For You" and "Drive All Night"), most played via sign requests. Add to that the strong core of songs from Magic ("Radio Nowhere," "Gypsy Biker," "Livin' in the Future," "Last to Die," "Long Walk Home" and "Girls in Their Summer Clothes") and you have a performance that’s justifiably been called "one of the best of the Reunion era" ever since. A Magic night indeed. For further reading, see our original rave review from that night in the Setlist archives. The 29-song set is available now from live.springsteen.net, in various downloadable digital formats as well as compact disc. 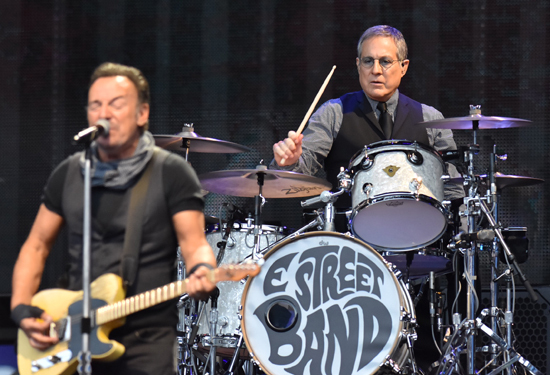 Happy birthday to Max Weinberg, who turns 66 today, born April 13, 1951. The custom drumhead may not have lasted... but the Mighty One's big beat goes on and on. The April 21 Upstage Jam, part of the 2017 Asbury Park Music & Film Festival at the Paramount Theatre, just got even cooler: Stevie Van Zandt has been added to the bill. This is his third scheduled APMFF appearance, along with a Front and Center performance the same day and a headlining show on April 22 with the Disciples of Soul. For the Upstage jam, which follows the world premiere of the Just Before the Dawn documentary, Stevie will join a host of longtime cohorts and Jersey Shore all-stars including fellow E Streeters David Sancious, Boom Carter, and Vini Lopez, along with Southside Johnny, Sonny Kenn, Ricky DeSarno, Joe Petillo, Richard Blackwell, Albee Tellone, Billy Ryan, and more, with Asbury Juke Jeff Kazee as music director. 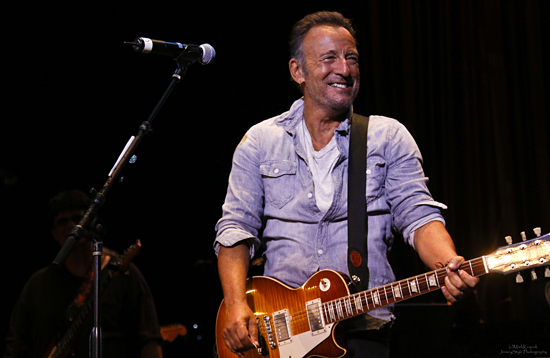 The event will be filmed for the Bruce Springsteen Archives and Center for American Music at Monmouth University. For additional information, see today's press release and visit apmff.com. When you're in the middle of the Jersey Shore music scene, it's easy to take the massive and diverse array of (mostly) homespun talent at its core for granted. It's not until the performers gather in one place once again that it hits you that these are some of the most gifted and vastly underrated musicians in the world that you showed up at your local bar to watch week after week. To those who were around in the late-'70s-to-late-'80s heyday, guys like Richie "La Bamba" Rosenberg were just people you saw around; you might just as easily bump into them at a nearby diner or pizza joint as at the back bar of the Stone Pony. They were not on some lofty perch, either — they were your friends, the guys who were just as eager as you were to check out the latest local talent onstage, or sit with you and talk about the Mets or (more likely) the Yankees while knocking back a beer or two. It seems impossible now, but back then, it was routine. You knew it wouldn't last, so you went to as many shows as you could. Each show was different; lineups were fluid, and you never knew who would show up to sit in. Gradually, they'd transition to other bands and bigger venues, to appearances on the national and international stage, and you'd root for them and feel proud that your friends had garnered some of the recognition they so richly deserved. Eventually they moved on, and the scene slowly disintegrated. You missed them, but you moved on too. You found other things to occupy your time, and life got more complicated, and maybe you forgot how much they once meant to you. 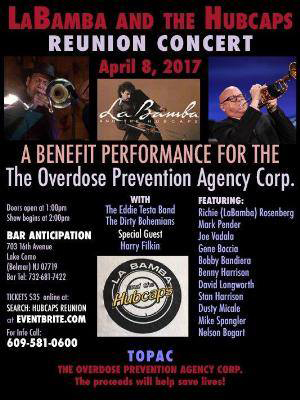 Saturday night at Bar Anticipation in Lake Como (aka South Belmar), NJ, La Bamba gathered his old band The Hubcaps back together for a benefit that was — as these events usually seem to be — as much a reunion of family and friends as a musical performance. Walking in to see him wandering through the room, stopping to chat with almost everyone, you could feel the years melting away. The diminutive guy with the trademark hat and mustache wasn't a "Late Night Tellyvision" star anymore, he was just that guy who played trombone with whichever band needed his services at the time, whether it was the Asbury Jukes, The Hubcaps, or an ad hoc house band supporting a benefit show. 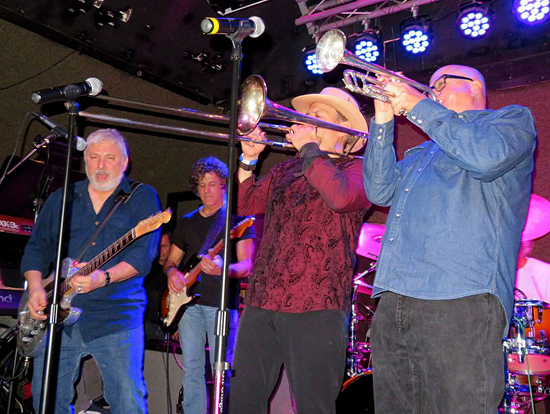 And many of his friends joined him onstage to join in the festivities, among them longtime cohort Mark "The Loveman" Pender [above, with La Bamba], former bandmates and Shore fixtures Bobby Bandiera [right], Stan Harrison, Mike Spengler, Joe Vadala, Gene Boccia, and Jack Scarangella (also of the Red Bank Rockers). Even ex-Juke and Light of Day founder Tony Pallagrosi showed up to take in the festivities. The Hubcaps' 90-minute-plus set was comprised of the '60s and '70s soul material they covered back in the day, including Curtis Mayfield's "Move on Up," Van Morrison's "Domino," even "When You Dance" by some guy who used to live up the road in nearby Bradley Beach. Highlighting the night was an extended jam on "Memphis" in unspoken tribute to the late, great Mr. Berry. Bandiera [right] and Vadala both took solos and La Bamba led the horns into the crowd, where they wandered, startling the occasional audience member by sidling up behind them and blasting away as the band held the groove from the stage. It has always been easy to be spoiled by how tight these guys are, easy to forget how effortlessly they knock out those horn riffs you've heard them play a thousand times. It's easy because they were once just your favorite bar band, and you didn't really think about it until you saw their talent affirmed by a certain Mr. Springsteen's consistent reliance on their consummate skill over the course of his own career, or by their endless session work and stints on late-night shows. And here they were again, putting a huge smile on your face, just your friends again for this one night, and they were still amongst the greatest musicians you'll find anywhere. 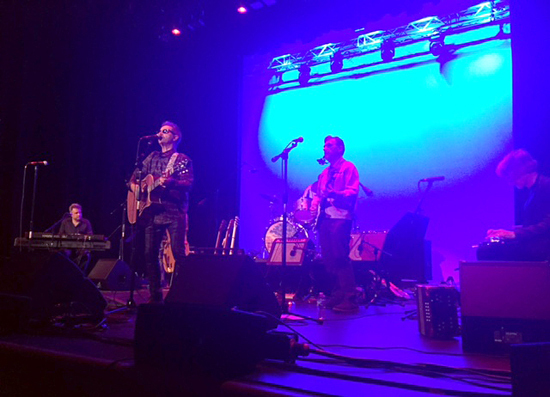 Opening for the Hubcaps was another Shore music veteran, Freehold native Eddie Testa and his band, accompanied by a small contingent of fans including a couple of E Street moms and assorted friends and relatives. Testa's band, which featured Mike Scialfa (Patti's older brother) on keyboards, played a set laden with '80s cover band fodder and the occasional Springsteen tune; "Tenth Avenue Freeze-out was dedicated to "Bruce's mom" Adele, who sat facing the stage at the front bar with the rest of the posse, a beatific smile on her face, occasionally clapping along and even getting up to dance with a couple of friends. It was great fun, and a much-needed respite from the tumultuous world outside. But all too soon, it was time to clear the room for the next event. It's never easy to leave such a reunion, but there have been promises from Mr. Rosenberg of more regular gigs on both the west and east coast to follow. And with an upcoming tour by another former bandmate and his Disciples, it promises to be a pretty good summer for the old school Shore music scene. 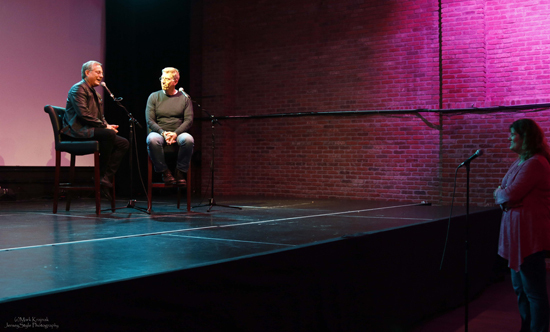 On Thursday night, a sold-out event at the Present Day Club in Princeton, NJ delivered some fascinating Bruce talk from a pair of beloved DJs. 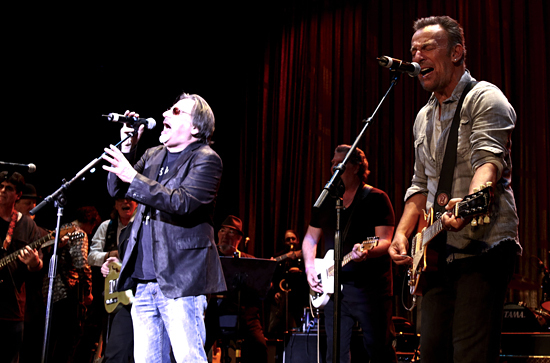 Bruce Springsteen on the Radio featured a conversation between radio legends David Dye of WXPN in Philadelphia, creator and host of World Café, and Tom Cunningham of the Sunday morning Bruce Brunch on the Jersey Shore's 105.7 The Hawk. Renowned photographer Frank Stefanko also appeared as the evening's special guest. 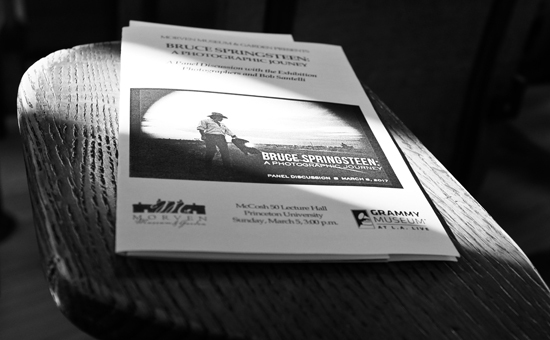 The program was presented in partnership with Princeton Public Library and Morven Museum & Garden, in conjunction with Morven's current exhibition Bruce Springsteen: A Photographic Journey, curated by The GRAMMY Museum in Los Angeles. 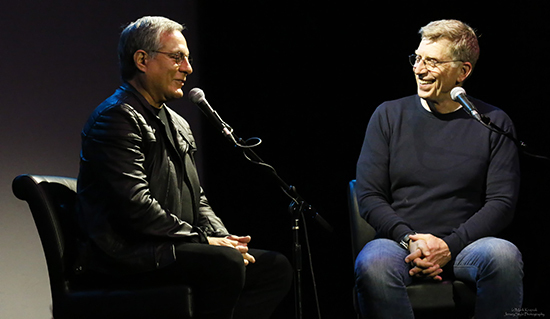 The first part of the evening centered around a discussion between Tom and David, who recently retired as full-time World Café host, on Springsteen's very early career and the influence of local radio stations and DJs. In the early '70s, David Dye was working as a DJ at Philadelphia's WMMR, legendarily an early Springsteen booster. 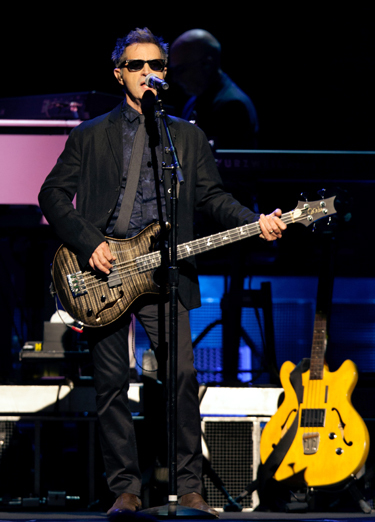 It was at The Main Point in Bryn Mawr, PA that David first saw Bruce live: "The first night was incredible for me." Overall, he went to seven or eight of the shows at the Main Point. After seeing Springsteen live, David revisited Greetings and opened his radio shows for quite a while thereafter with "Spirit in the Night." Tom played a clip from the Born to Run audio book in which one of David's visits to the Main Point receives a shout-out. In the memoir, this mention serves as an intro for Bruce to discuss his relationship with several DJs from the early '70s. A highlight of the evening was a discussion regarding the Swarthmore College show in April, 1974 — David is a Swarthmore graduate, and he assisted in the coordination of that outdoor event. 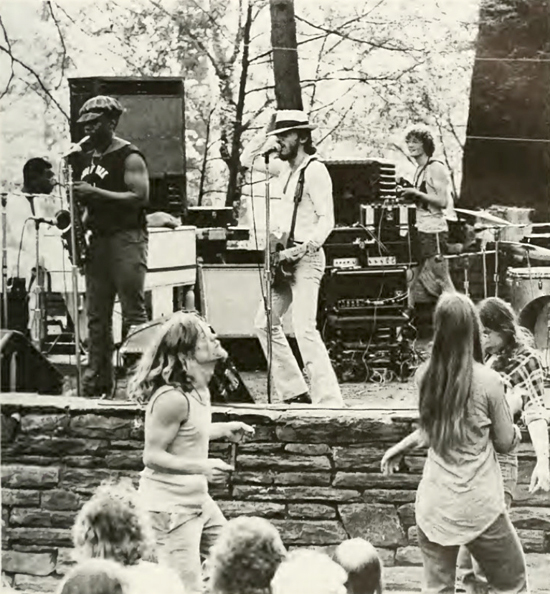 The afternoon concert brought approximately 300 people to the amphitheater, and of course, according to David, it was a great show — with Boom Carter and David Sancious in the band at the time, Dye recalled it as "more of a 'jazzy Bruce' than today's shows." Many in the audience apparently weren't aware of Springsteen and the E Street Band prior to the concert, but "they all had a fabulous time." Tom Cunningham spoke about his first show, just one month after Swarthmore, in May 1974 at the War Memorial Theater in Trenton. 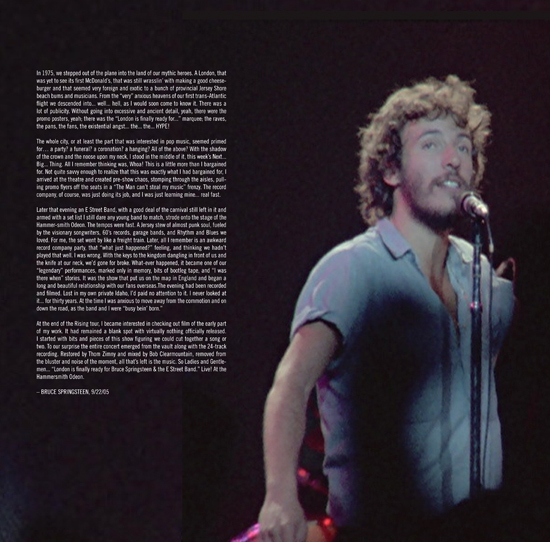 He said that in speaking with Bruce about ten years later, he still remembered the show and the beauty of the venue. Tom also treated us to an audio clip from August 1978, when Bruce was playing a show at the Spectrum and dedicated a song to Dye for his great support of the band — Springsteen said that he knew David wasn't there but asked that someone please let him know that he sent him a hello from the stage. Among the other highlights of the evening was a 20-minute conversation with photographer Frank Stefanko, whose work graces the covers of Darkness, The River, and the Born to Run memoir. 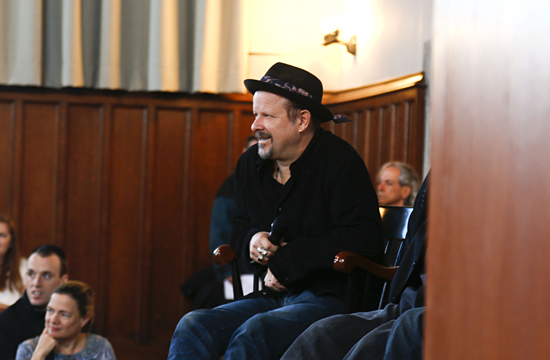 Frank surprised the audience by announcing that Barry Rebo, producer and cinematographer, was in the audience. Rebo's vintage footage has provided much of the basis for films from the Born to Run, Darkness, and River reissue sets. Frank also spoke about his forthcoming book, a massive undertaking collecting his photos of Bruce from the last 40 years, which he has been working on with Guido Harai, the Italian photographer and publisher. He said that during this past week he did a new photo session in Colts Neck, NJ for the book, due later this year, hopeful that this last set of photos will bring the project full circle. 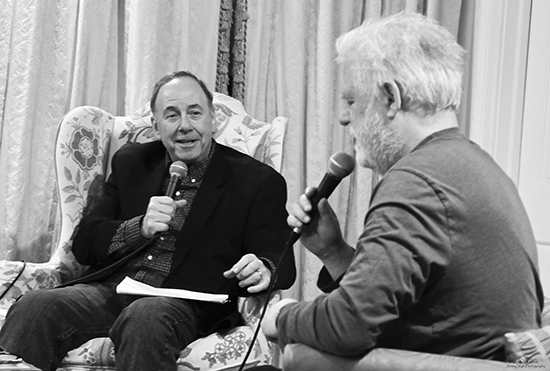 Frank talked about Philly radio in the early '70s, too, and the difference between the standard "bubblegum music" of the day and what Bruce brought to the airwaves — a combination of jazz, blues, and classic rock 'n' roll. Because of this unique sound, his music stood out for Frank in the very early days. The entire discussion will be available on You Tube shortly. When it's available, take some time to listen — it was great fun. Also, if you're in the area, it's not too late to see the Bruce Springsteen: A Photographic Journey exhibit at the Morven Museum at Princeton University, closing on May 21. As announced officially today, Soulfire will be released May 19 on CD/digital download and July 14 on vinyl. Click here to pre-order your copy, which comes with an immediate free download of the first single "St. Valentine's Day" and the promise of more free advance track downloads to come. As Steven has commented previously, Soulfire is essentially "me covering me... songs I've written or co-written for other people," with the exception of a few tracks written by other songwriters. In today's official announcement, Van Zandt goes deeper: "I've always been very thematic with my work, very conceptual. I need a big picture. I can't just do a collection of songs; that doesn't work for me. In this case, the concept became me. Who am I? I'm kind of my own genre at this point. So I tried to pick material that when you added it all up, really represented me. So there are a couple of covers, a couple of new songs, and some of what I feel are the best songs I've written and co-written over the years." 1. "Soulfire" (Co-written with Anders Bruus of The Breakers) "Doing the [Underground Garage] radio show keeps you very much in tune with what's going on in the world of rock 'n' roll. It's not the real world, we live in a completely parallel universe, but we've broadcast over 700 new bands in the past 14 years. A lot of them we signed to my Wicked Cool label, like The Breakers, who are a very good band from Denmark. This was a way of exercising my songwriting muscles at that time. I try to live with purpose, and that includes songwriting. I don't get up every day and write a song just to write a song, I have to have a specific reason for it. So if I'm producing a band and I feel they need a little something extra or something specific, I'll write it for them, or in this case, with them. To some extent, that's what kept my songwriting alive over these past years." 2. "I'm Coming Back" (Originally found on Southside Johnny and the Asbury Jukes' 1991 LP, Better Days) "I did their first three albums in 1976, 1977, and 1978 but then we didn't work together for another 15 years. The lyrics were perfect for Southside at that point and they work for me, at this point. It's one of my favorite lyrics that I've ever written." 3. "The Blues Is My Business" (Written by Kevin Bowe and Todd Cerney, recorded by Etta James in 2003) "I've never recorded a real urban Southside-of-Chicago blues thing before. I went though a blues period growing up but by the time I got to the recording studio, I'd kind of gone in a different direction. We worked it out for BluesFest and I liked the arrangement so much, we recorded it for the album." 4. "I Saw the Light" "I had half-written it for Richie Sambora & Orianthi but the next time I talked to him he had already written 40 songs so I didn't bother finishing it. I came across it as we were making my album and thought, I like this, maybe I'll finish it for me." 5. "Some Things Just Don't Change" (Originally found on Southside Johnny and the Asbury Jukes' 1977 LP, This Time It's For Real) "One of my favorites. I wrote it with David Ruffin and The Temptations in mind. I was basically trying to write a classic Motown song. It can be an interesting artistic challenge writing for other people. As third generation rock 'n' rollers we grew up post-show business. It was art form by then, very autobiographical. That's one of the reasons for its success as an art form, people relate to rock 'n' roll in a personal way. So part of you wants to write something traditional, something classic, but part of you always wants to keep it very personal." 6. "Love on the Wrong Side of Town" (Co-written with Bruce Springsteen and originally found on Southside Johnny and the Asbury Jukes' 1977 LP, This Time It's For Real) "Bruce had the riff and I did the rest. When you wrote, arranged, and produced the original versions, it's not always easy to redo them. They become definitive. You did it that first way for a reason. I found it difficult to do much with this one but when we got to the end of the song I found an opportunity to change it up a little bit. I changed little things here and there on all the songs on the album but it definitely took a minute." 8. "Down and Out in New York City" (Written by Bodie Chandler and Barry De Vorzon and originally recorded on James Brown's 1973 Black Caesar soundtrack) "I love the blaxploitation genre — we do a special on the radio show every year, the day after Thanksgiving, we call it 'Blaxploitation Friday.' My favorite has always been James Brown's theme from Black Caesar. It has the immediate common ground for me of being about New York City. We did it for BluesFest, came up with a really cool groove and a new horn line and made it our own. It has a bit of a jazzy element, which I explored with my Lilyhammer score, but like the blues song, it's unlike anything I've ever recorded before on a solo album so it was nice to get those genres onto a record." 9. "Standing in the Line of Fire" (Co-written with Gary U.S. Bonds and Laurie Anderson and originally found on Gary U.S. Bonds' 1984 Standing in the Line of Fire) "Gary U.S. Bonds is somebody you don't want to mess with. The records I did with him are so damn good, I thought, I can't really beat this, I need to really change it somehow. So I added a piece of music I did for Lilyhammer — now it's like Gary U.S. Bonds-meets-Ennio Morricone." 10. "Saint Valentine's Day" (Originally found on The Cocktail Slippers' 2009 LP, Saint Valentine's Day Massacre) "I wrote it for Nancy Sinatra but unfortunately never did the session. I recorded it with The Cocktail Slippers, similar to the way I was going to do it with Nancy, and then David Chase liked it so we did a more rock 'n' rolly guys' version of it for his movie, Not Fade Away. For my version, I added a horn line that I think changes the whole complexion of the song, makes it more of a soul thing." 12. 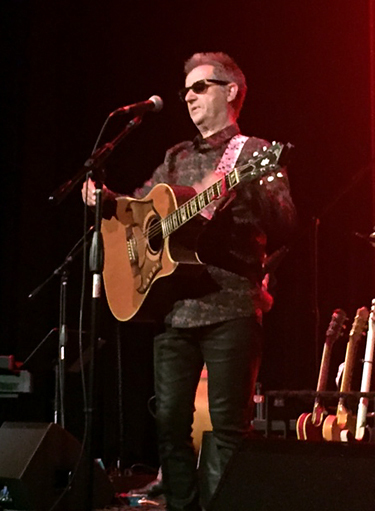 "Ride the Night Away" (Co-written with Steve Jordan and originally found on Jimmy Barnes' 1985 LP, For The Working Class Man; later recorded for Southside Johnny and the Asbury Jukes' 1991 LP, Better Days) "Steve Jordan came over to my house one day and said, 'I've got a Jimmy Barnes session, I promised him a song and I don't have one so I'm not leaving until we write one.' That kind of songwriting-on-a-deadline goes back to Leiber & Stoller as well — I love that whole Brill Building thing, I wish I'd been around for that period." Soulfire was arranged by Steve Van Zandt and recorded last autumn at his own Renegade Studios in New York City. 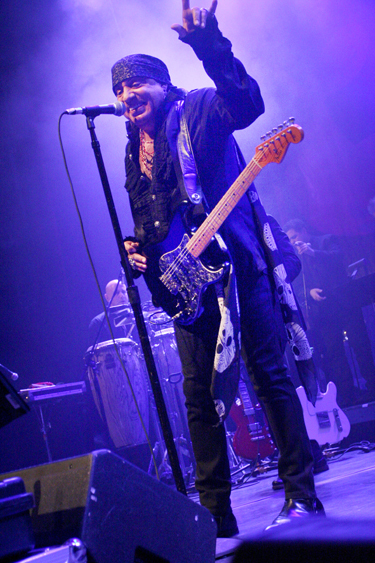 Van Zandt co-produced the album with Marc Ribler and Geoff Sanoff. The album was mixed by Bob Clearmountain and mastered by Bob Ludwig. 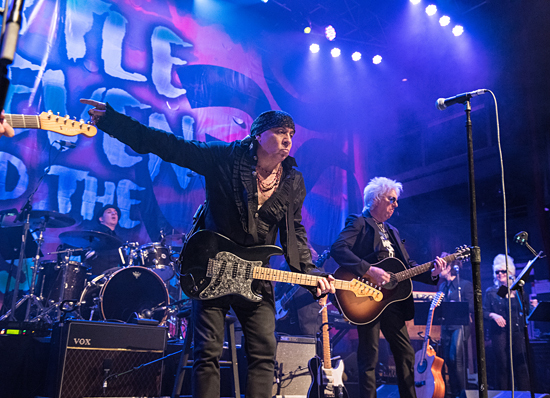 Ribler also serves as guitarist and musical director for the 2017 edition of Little Steven & The Disciples of Soul, who will be touring Europe and the U.S. behind the album. Visit the newly redesigned LittleSteven.com for all currently announced dates. 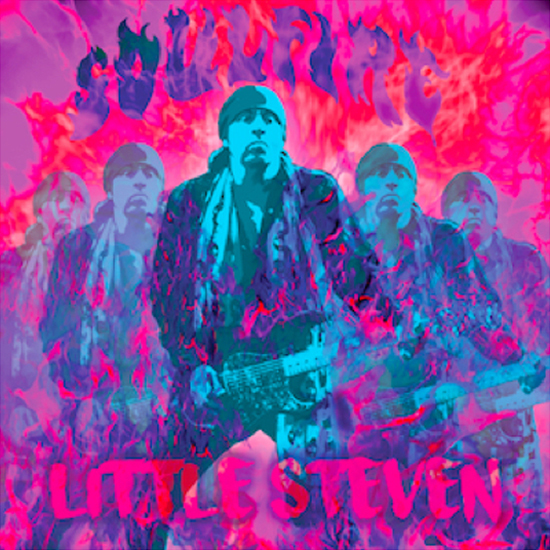 Anticipation is building for Little Steven's upcoming return to Asbury Park... souls will go weak when the Disciples give them a double shot. And through NJArts.net, you've got a chance to win a pair of loge tickets to the big Saturday night show at the Paramount Theatre, April 22. Click here to find out how you can enter the contest, with each $10 donation to the site getting you another chance to score those seats. Jay Lustig has been doing consistently great work at NJArts.net for more than two years now, with timely coverage of arts and entertainment of all stripes in the great state of New Jersey, and we encourage you to lend your support! The deadline to enter is midnight April 17, and the winner will be announced on April 18. 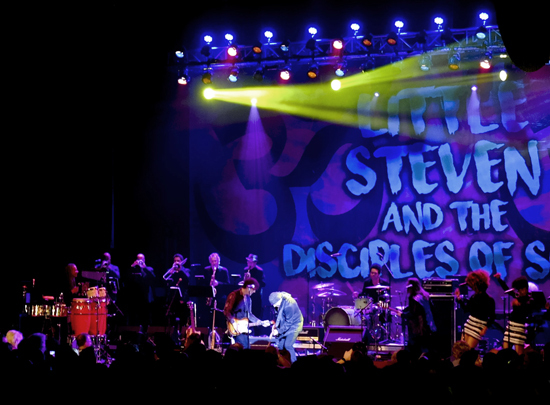 The 2017 Asbury Park Music & Film Festival has announced today that Little Steven & the Disciples of Soul have added an additional performance: a live episode of the public television live music series Front and Center, on Friday, April 21 at 4pm, at Asbury's House of Independents. VIP tickets, at $325 and limited to 50 people, will include assigned seats, a meet & greet with Steven Van Zandt, Festival gallery pass, and cocktail ticket. Standing general admission tickets will be available for $75. Tickets go on sale tomorrow, Wednesday, April 5, at 10am Eastern via apmff.com and the House of Independents box office. Update: the ticket sale has been rescheduled, moved to Friday, April 7 at noon. Event page here... and online ticketing here. There's even more E Street flavor in store at the 2017 Absury Park Music Music & Film Festival later this month, with a Max Weinberg event now on the schedule. Bob Santelli, who interviewed Bruce Springsteen down the road at Monmouth University earlier this year, will hold a conversation with the Mighty One on April 22 at Asbury Park's House of Independents. That's at 4:45 on Saturday afternoon, in between Friday night's Upstage event and Saturday night's big show by Little Steven and the Disciples of Soul. For ticketing and more information, visit houseofindependents.com and apmff.com. 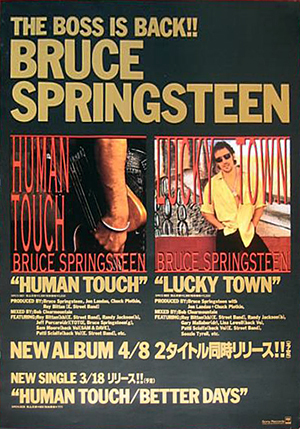 On this date in 1992, Bruce Springsteen simultaneously released Human Touch and Lucky Town, his first two albums after informing the E Street Band in late 1989 of his plans to work with other musicians, and of their freedom to "pursue other projects" for at least the foreseeable future. Not surprisingly, these albums were not greeted with the same level of enthusiasm generated by Springsteen's previous collaborations with the E Street Band. And it wasn't just the paisley shirts. Many fans viewed the idea of Bruce recording with other musicians as some kind of betrayal (or a needless undertaking, at least). Songs with great bones were at times concealed behind slick production. And on Lucky Town, Springsteen exulted over "Better Days" while, as Dave Marsh would observe, a large part of his audience instead faced many more "bitter days" in the midst of continuous economic decline and the aftermath of the Gulf War. During his 1999 Rock & Roll Hall of Fame induction-acceptance speech, Springsteen humorously but disparagingly characterized this period of his songwriting as one where he wrote "just happy songs... it didn't work; the public didn't like it." Even one of Lucky Town's outtakes, which later appeared on Tracks, was entitled, simply, "Happy." It's a shame, however, that such a mythology has developed around this music and the period during which it was released, especially since it's so far from the truth. 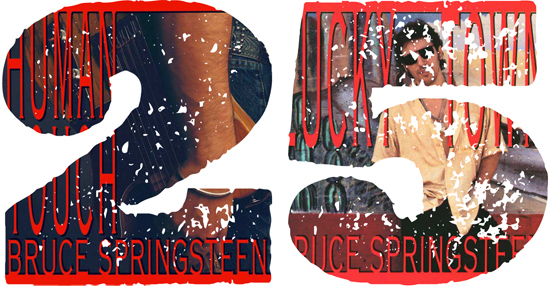 In reality, over the course of these two 1992 albums, Bruce Springsteen delivered some of his best songs about adulthood, adult relationships, and the many joys and complexities that accompany them. On Human Touch, songs like the title track, "Soul Driver," "With Every Wish" and "Man's Job" (not to be confused with "Real Man") were just as moving and perceptive about love, loss, fear and moving on as was the best material on Tunnel of Love, the studio album that immediately preceded the 1992 releases. "Real World," despite a recording that didn't improve on its less-is-more Christic debut, remains one of Springsteen's masterstrokes (and he later rediscovered the power of the song's solo piano arrangement on the 2005 Devils & Dust tour). 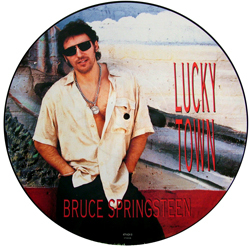 In addition to its obvious singles, Lucky Town also produced two deep-cut Springsteen classics, "If I Should Fall Behind" and "Living Proof" (written on the occasion of the birth of Springsteen's oldest child,) that so many have since embraced when celebrating a wedding or birth. 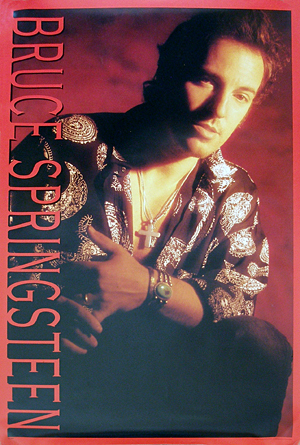 (The studio version of "If I Should Fall Behind," it should be noted, was soon eclipsed by several superior live recordings of the song, beginning with the In Concert: MTV Plugged version with the 1992-93 band, continuing through the moving Live In New York City E Street Band reunion version and culminating with the waltz-time Sessions Band Live in Dublin version.) And while Bruce may have expressed more personal happiness and inner peace in songs like "Leap of Faith," he also remained a mature, perceptive observer of harsh realities, as evidenced by the searing "Souls of the Departed." Looking back, it certainly confused matters more than a bit to issue both of these albums on the same date with the same typefaces used in their cover art and packaging. While many fans were happy just to have so much new Springsteen music issued all at once, especially after more than four years had passed since Tunnel, releasing the albums this way greatly obscured the fact that they actually were two very different records, musically speaking. (It's a distinction that wasn't encouraged by the double-A-side single, "Human Touch"/"Better Days.") The move to release Human Touch and Lucky Town in this manner was inspired very much by Guns N' Roses' simultaneously released (and commercially successful) 1991 albums Use Your Illusion I and Use Your Illusion II. There was much more stylistic unity to be found between those GNR albums, however, than between Human Touch and Lucky Town. Not that either Springsteen album represented that radical a musical departure for him. After all of the fussing and fretting over working with new musicians and pursuing new musical directions, none of this material sounded alien to E Street-attuned ears. Granted, there were some new approaches and not a single sax solo to be heard, but there still were plenty of powerful drum parts, guitar solos and soulful vocals. There was something very familiar about many of those keyboard parts, too, since Roy Bittan remained a major collaborator for Bruce. 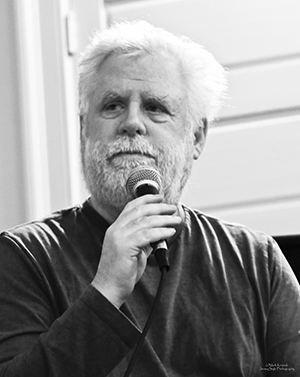 Roy not only played keyboards on most of the HT/LT tracks, he also co-produced both albums with Springsteen, Jon Landau and Chuck Plotkin, and co-wrote Human Touch's "Real World" and "Roll of the Dice." Bittan would tour with Springsteen behind these records, too. His E Street predecessor, David Sancious, handled keyboard duties for "Soul Driver" and "Part Man, Part Monkey," a Human Touch outtake issued as a B-side and later on Tracks. These Human Touch sessions marked Sancious' first in-studio work with Springsteen since "Born to Run." E Streeter Patti Scialfa also provided background vocals on Human Touch's title track and was joined by her former Trickster busking pals, future E Streeter Soozie Tyrell and future Sessions Band member Lisa Lowell, to form a vocal trio on Lucky Town's "Better Days," "Local Hero" and "Leap of Faith." 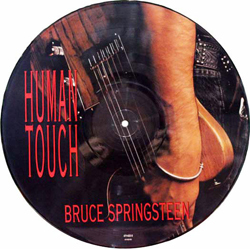 Recording sessions for Human Touch took place over two distinct periods: from December 1989 through June 1990, and then picking up again from December 1990 through January 1991. 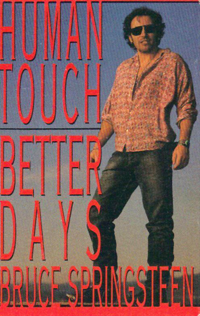 Before releasing Human Touch, however, Springsteen became inspired to record yet another album's worth of songs. The sessions for those songs, which commenced later in 1991, moved much more quickly. All ten tracks on Lucky Town were completed by the end of the year. In fact, the only other Lucky Town session took place on January 18, 1992, to record "Happy," which was written and recorded to celebrate the arrival of Jessica Rae Springsteen, born just a few weeks earlier. It wound up as an outtake that later appeared on Tracks. As noted previously, each album took a different musical approach overall. Human Touch definitely had a more elaborate sound. Its rock-R&B mix was highly polished with '90s-style studio perfectionism and a synthesizer sheen. There even was a bit of a hip-hop influence to be found in "57 Channels (And Nothin' On)", an element that Little Steven would expand upon greatly when asked to remix the track for a CD single. Meanwhile, Lucky Town had a looser feel dominated by basic rock drums and guitars, but enhanced a bit with gospel-tinged organ and backing vocals on the upbeat numbers, and softened with acoustic guitar and synthesizer on quieter, slower tracks like "The Big Muddy" and "Book of Dreams." Both albums featured stellar contributions from many famous musicians. 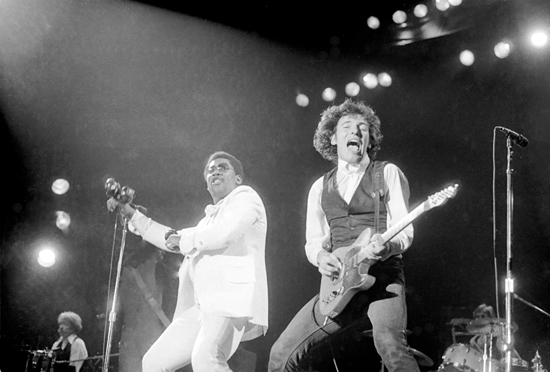 Living soul legend Sam Moore backed Bruce's vocals on "Soul Driver," "Real World," and "Man's Job" while the late blue-eyed soul legend Bobby Hatfield sang behind Springsteen on "I Wish I Were Blind." 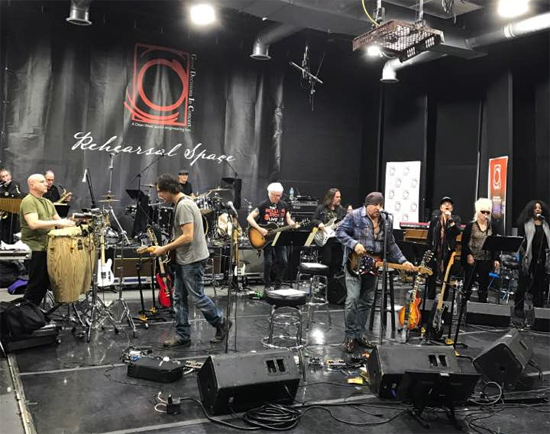 Other well-known session veterans rounded out the support, including trumpeter Mark Isham, bassist (and future American Idol judge) Randy Jackson, late keyboardist (and former Face/Small Face) Ian McLagan, and late drummer Jeff Porcaro of Toto fame. 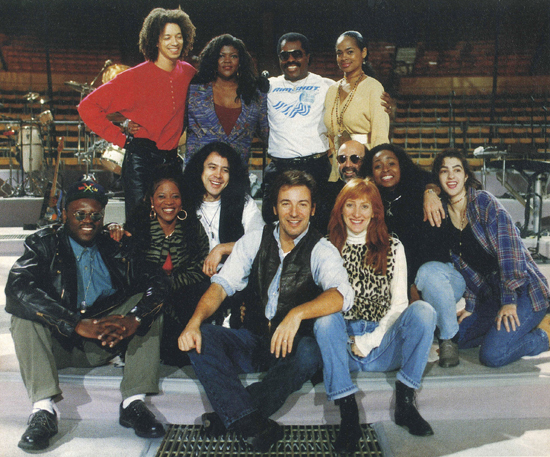 Bruce Springsteen and Patti Scialfa, who often was a guest backing vocalist on the 1992-93 World Tour, with the touring band at Boston Garden, December 1992. Front row L-R: Tommy Sims, Cleo Kennedy, Shane Fontayne, Bruce & Patti, Roy Bittan, Crystal Taliefero and Gia Ciambotti. Back row L-R: Zack Alford, Carol Dennis, Bobby King and Angel Rogers. Photograph by Stan Grossfeld, courtesy of Shane Fontayne. "It was painful, but in truth, we all needed a break. After sixteen years, a reconsidering was in order. I left in search of my own life and some new creative directions. Many of the guys did that as well, finding second lives and second careers as musicians, record producers, TV stars and actors. We retained our friendships and stayed in touch. When we would come back together I would find a more adult, settled, powerful group of people. Our time away from one another gave us all a new respect for the man or woman standing next to us. It opened our eyes to what we had, what we'd accomplished and might still accomplish together." - March 31, 2017 - Shawn Poole reporting, with invaluable assistance from Brucebase's "On The Tracks: A Studio Guide to Bruce Springsteen"
As the Asbury Park Press's Jean Mikle reports, Steven Van Zandt stopped by the old Upstage Club location in Asbury Park yesterday to be interviewed for the upcoming documentary Just Before the Dawn: Riot, Redemption, Rock 'n' Roll. 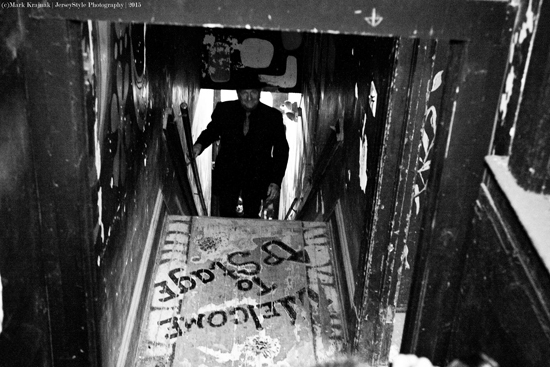 Speaking with director Tom Jones and taking him through his old stomping grounds, Stevie called the Upstage "a little sanctuary for the freaks," the "freaks, outcasts and misfits" who came there to plug in to the club's wall of speakers and jam in the late '60s and early '70s. 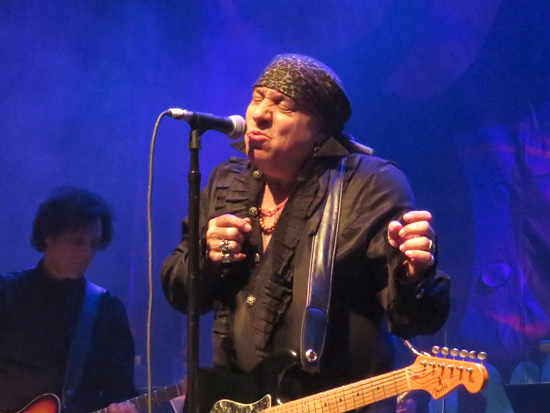 Read Mikle's report, "Little Steven Van Zandt relives Upstage Club memories," with a photo gallery by James J. Connolly. The documentary will premiere April 21 at the Asbury Park Music and Film Fest, with Stevie and his Disciples of Soul performing the following night. After reading last week's reports regarding the recent passing of Chuck Berry, longtime Berry/Bruce Springsteen fan and Born to Run album cover photographer Eric Meola contacted us with a fascinating insight. Eric pointed out that the final verse of every version of "4th of July, Asbury Park (Sandy)" features the image of lovers parked "out on the Kokomo." Meanwhile, Chuck Berry's "No Particular Place to Go" contains the line, "So we parked way out on the Kokomo." As far as we can tell, this is the earliest known direct Chuck Berry reference to be found in a Springsteen song. In the case of Berry's song, it actually might have been referring to a real place. The Kokomo Reservoir is a 482-acre area near Kokomo, Indiana that's popular for fishing, picnics, etc. (The Grateful Dead also referenced "the Kokomo" in "So Many Roads.") It's probably a good area to park with your baby, too, but obviously nowhere near Asbury Park. In fact, we found no evidence of there ever being a real place in or near Asbury Park, NJ known as "the Kokomo." It apparently existed only in the imaginings of a young Chuck Berry-obsessed New Jersey singer-songwriter... and everybody in his audience, of course. In any case, it's quite a kick to think of the narrator in Chuck Berry's song also being that "lover boy" parked out on the Kokomo with Bruce's narrator's ex ('that waitress I was seein'") in "Sandy." The Kokomo popped up again years later in the lyrics to Springsteen's "Light of Day," yet another Berry-influenced song from Bruce's Golden Chuck Berry Decade of the 1980s. This was the song that Bruce wrote specifically for Paul Schrader's 1987 film of the same name (starring Michael J. Fox and Joan Jett) to "atone" for stealing the original title of Schrader's screenplay: Born in the U.S.A.
Chuck Berry's "Promised Land" was the first single he released after his 1961 imprisonment for 20 months on charges related to The Mann Act, officially entitled "The White-Slave Traffic Act." This federal law, on the books since 1910, resulted in many double-standard arrests, convictions, and sentences over the years, for reasons of racism, sexism or classism. In his 1986 book Written in My Soul: Conversations With Rock's Great Songwriters, Bill Flanagan wrote, "People who knew Berry before he went to prison in the early sixties say he went in a great guy and came out two years later a cold, bitter man. In the twenty-five years since, his reputation has been of a performer who trusts no one, handles his own business and must be paid in cash before he sets foot on stage. Then he runs through his oldies (and whatever else pops into his head) for the contracted number of minutes and splits without doing an encore. He almost always plays with pickup bands hired by the local promoter, and almost never rehearses with them." That certainly doesn't mean Chuck Berry never had to deal with racism before his imprisonment. In The Heart of Rock & Soul: The 1001 Greatest Singles Ever Made, Dave Marsh analyzed the revelation in Berry's autobiography that in 1955 he first wrote the line "There lived a colored boy named Johnny B. Goode" but felt forced to change his lyric out of fear that too many white radio programmers and listeners weren't ready for a black hero in their music of choice. "By changing 'colored' to 'country,'" wrote Marsh, "he found that, instead of speaking for himself alone, he'd created a character who also symbolized the likes of Elvis Presley, another kid whose momma promised that 'someday your name will be in lights.' Horrible as the source of the compromise may have been, its effect was to treble the song's force. For ultimately, if you could identify with either Presley or Berry, there was a chance you could identify with both. The result is history — and not just pop music history." 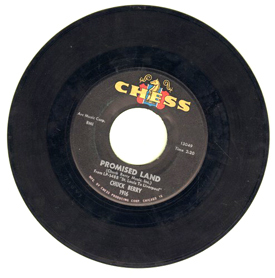 When Berry wrote and released "Promised Land" in December 1964, the Civil Rights Movement was in full swing. W.T. Lhamon, Jr. noted in his book Deliberate Speed: The Origins of a Cultural Style in the American 1950s that many of the locations Berry sang of passing through on his journey to "the promised land" actually were key battlegrounds in the Civil Rights struggle, including where Chaney, Goodman and Schwerner were murdered in the heat of Mississippi Freedom Summer 1964. "Beneath his smiling patina," wrote Lhamon, "Berry's song is as apocalyptic as Martin Luther King, Jr.'s last speech [during which King concluded in the midst of known threats to his life, "I may not get there with you, but I want you to know tonight that we as a people will get to the promised land!" Less than twenty-four hours later, he was assassinated. ]… Reverend King and Chuck Berry shared images and concepts that stem from a root source… But so much incantation of the phrases betrays doubt about their claims. King, Berry and their followers both believed and disbelieved in America as a promised land, were sure that democracy was real and sure that it was a carrot cruelly eluding its most dogged pursuers." Bruce Springsteen's "The Promised Land" was written more than a decade after Berry's "Promised Land." 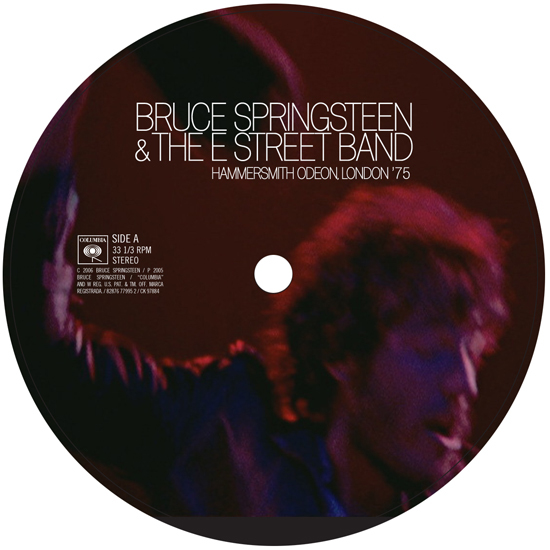 Since its 1978 release on Darkness on the Edge of Town, it has been played almost every night on almost every subsequent Bruce Springsteen & The E Street Band tour (the Tunnel of Love Express Tour being the sole exception,) and at almost every show of most of Bruce's non-E Street Band tours, as well (the 1992-93 tour being the sole exception.) It also has become one of Springsteen's "go-to" songs when performing at various political events over the years, beginning more than three decades ago with the 1982 Central Park Rally for Disarmament. Usually he sings it by himself, standing on stage alone with just his guitar and harmonica. This proud child of Chuck (to paraphrase Bob Seger's "Rock and Roll Never Forgets"), who has sung, spoken, and written so knowingly about how racism is used to divide and conquer people with common needs, always closes with those last lines of that final verse: "Blow away the lies that leave you nothing but lost and brokenhearted." Just before he performed the song at the 1996 Anti-Proposition 209 Rally in Los Angeles, Bruce said, "I believe that Promised Land that Martin Luther King so eloquently envisioned and died for is still attainable, but it's not here and we're not there. It's somewhere up ahead... maybe in my kids' future, maybe in your kids' future. I hope so, but right now we need to protect the tool that will allow us to build the kind of country where future generations will find their opportunities, their rights and their dreams well-protected. That's our job now... Let's stand together in defense of that Promised Land." Chuck Berry died in the same year that will mark the 50th anniversary of the federal trial related to the Mississippi Freedom Summer murders. None of those convicted in that trial served more than six years in jail. Nevertheless, during Chuck Berry's ninety years on this planet, he witnessed many sweeping changes in our nation's history, and his music helped greatly to break down so many important barriers. In this week following his passing, watching and re-watching those great Rock and Roll Hall of Fame videos of him so deservedly becoming the first person ever inducted into the Hall, or of him, Bruce and the E Street Band playing the first number at the concert to celebrate the opening of the Hall ("Johnny B. Goode," of course,) has me hoping that in his later years he was able to find something far better than just the pain, bitterness and distrust of those earlier days. Rest in peace, Chuck. What Bruce said back in '96 is still true, of course. It's still not here and we're still not there, but here's hoping that one day we'll finally reach that Promised Land that your music mapped, and will continue to map, for so many of us still making the journey. Sure, it was back in the 1970s when Bruce Springsteen & The E Street Band performed a ton of Chuck Berry covers in concert. During that decade, Bruce also began quoting Berry's "You Can't Catch Me" at the end of live versions of "Growin' Up." ("...and it was bye-bye, New Jersey... we were airborne!") And yes, in the '70s he even borrowed a song title from Chuck for "The Promised Land." 1. 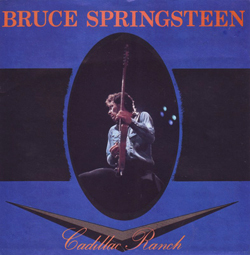 "Cadillac Ranch" - The first officially released Springsteen recording that actually sounds like a Chuck Berry record. 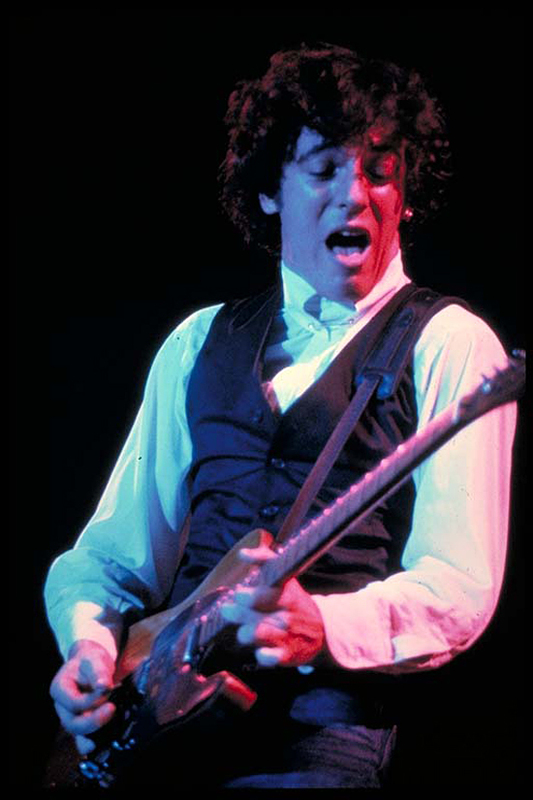 No wonder Bruce often preceded live performances of it with some of Berry's "No Money Down" on the 1980 leg of The River Tour. It's not just the guitar lines and clever, detail-packed lyrics (focused on car imagery, of course.) It's also Roy Bittan channeling the late, great Johnnie Johnson, the Rock and Roll Hall of Famer who played the piano on many of Berry's greatest records. Hiding deeper meaning (in this case the inevitability of death) just beneath the lyrics' surface is a very Berryish move, as well. Note: The alternate take of "Cadillac Ranch" recently unearthed by the Odds & Sods bootleg drops the saxophone in favor of even more Berry-like guitar. 2. "I'm a Rocker" - A la "The Promised Land," did Bruce swipe the title for his song released on The River from an earlier Berry recording, this one from Chuck's 1970 album Back Home? For that matter, did this song later provide Bruce with an idea or two for Born in the U.S.A.'s "I'm Goin' Down," too? 3. "From Small Things (Big Things One Day Come)" - A wonderful story song, in the grand Chuck Berry tradition of great storytelling and clever wordplay. 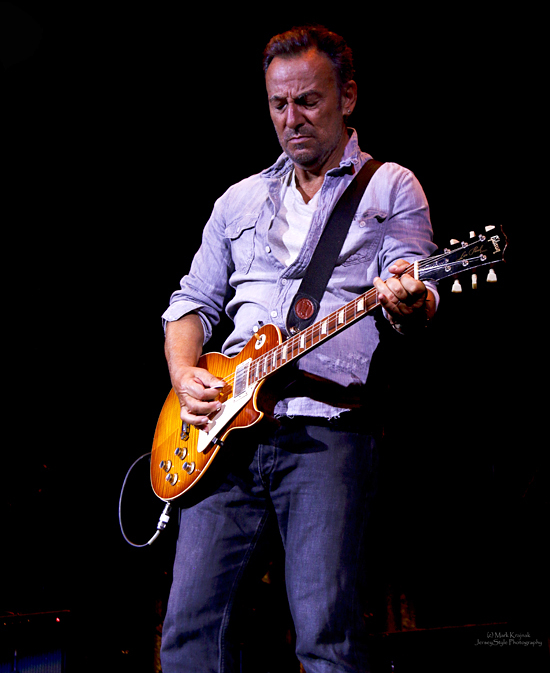 Springsteen wrote and recorded his version for his first 1980s album, The River, but it remained unreleased until 2003's The Essential Bruce Springsteen. Before that, Bruce allowed Dave Edmunds to record the first officially released version, which appeared on Edmunds' 1982 LP D.E. 7th and saw some action as a mildly successful single, too. 4. "State Trooper" - The first of two Nebraska tracks with strong Berry connections. This one doesn't sound much like the music in any of the most famous Berry records, but it bears some musical similarity to his lesser-known, quieter and spookier bluesy tracks. More important, the whole scenario about a wet night on the New Jersey Turnpike and encountering a state trooper in "the wee, wee hours" comes straight outta Chuck Berry's "You Can't Catch Me." Incidentally, "You Can't Catch Me" also is where John Lennon got "Here come ol' flat-top..." for "Come Together." 5. "Open All Night" - Can't get more Berry-like than this, Nebraska's most upbeat track. The closing line, "Hey, ho, rock 'n' roll, deliver me from nowhere," echoes "Hail, hail rock and roll, deliver me from the days of old" from Berry's classic "School Days." And hey, there are those "wee, wee hours" again. 6. 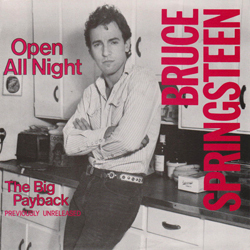 "The Big Payback" - A Nebraska outtake first released as a B-side in the 1980s and later re-released on the bonus disc of The Essential Bruce Springsteen. Bruce channeling Chuck once more. 7. "Downbound Train" - Chuck Berry's "Down Bound Train," aka "The Down Bound Train" or "Downbound Train," was released in 1955 as the B-side of "No Money Down," a record with which Bruce Springsteen certainly was familiar. (See the entry for "Cadillac Ranch" above.) Berry's "Down Bound Train" has an eerie quality to it, relating a drunkard's dream of traveling to Hell on a train full of losers and sinners who've squandered their lives. Perhaps the eeriness of Berry's record and its focus on those whose lives have become a living hell helped to inspire Springsteen's "Downbound Train," featured on Born in the U.S.A.
8. "I'm Goin' Down" - See the entry for "I'm a Rocker" above. 9. 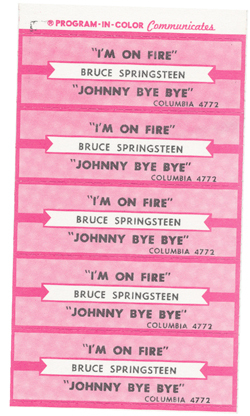 "Johnny Bye Bye" - First released in 1985 as the B-side of the "I'm On Fire" single. A slightly different mix, with a hyphenated "Bye-Bye" added to the title, was released later on Tracks. This sounds almost nothing like a Chuck Berry song, though Berry actually shares a songwriting credit for it with Bruce. That's because Springsteen used the opening line from Berry's "Bye Bye Johnny" for this song's opening verse, as well as a slightly altered version of Berry's song's title. Berry's song was a rocking sequel to "Johnny B. Goode" in which Johnny finally became a star. Since Berry's "Johnny B. Goode" saga could be taken as an allegory of the rise of Elvis Presley, it was highly appropriate for Bruce to incorporate some of Berry's lyrics into his song about Presley's tragic downfall and death. 10. "Stand on It" - a Born in the U.S.A. outtake that first was released in 1985 as the B-side of the "Glory Days" single, then later released in a slightly longer version with an extra verse on Tracks. Another fun Berry-style fable, built around a series of immensely descriptive vignettes filled with auto-racing terminology and topped off with a nice little Berry-flavored guitar solo smack dab in the middle. It's all over in about three minutes, too. Oh, and Christopher Columbus and Queen Isabella drop in out of nowhere, just like the Venus de Milo did in "Brown Eyed Handsome Man." - March 24, 2017 - Shawn Poole reporting - special thanks to Ryan Hilligoss - For more on all things Springsteen/Berry, check out Ryan's Let It Rock!!! The Music of Chuck Berry and Bruce Springsteen, a 2013 blog entry written to salute Chuck Berry on his 87th birthday. 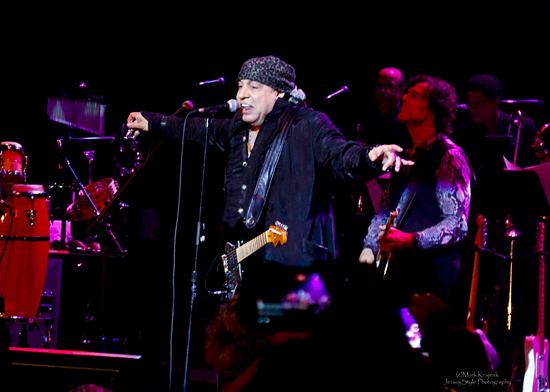 Little Steven has tweeted that we can anticipate a Disciples of Soul U.S. tour in September. But after Saturday's Rock and Roll for Children benefit, appetites are whetted... and Stevie's coming through with one more in the near term, headlining the Asbury Park Music & Film Festival in April. 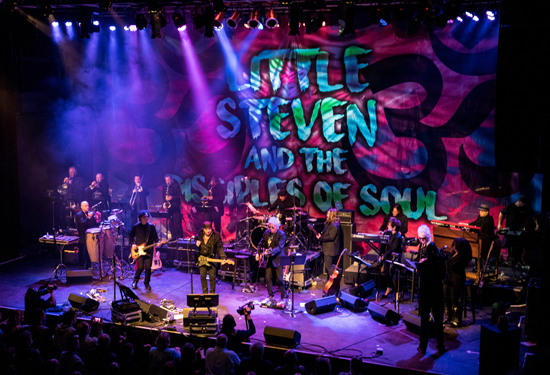 The night after the APMFF's Upstage Jam — with Southside Johnny just added to the bill — Little Steven and the Disciples of Soul will play the Paramount Theatre, Saturday, April 22. Tickets go on sale at 10am tomorrow, Friday, March 24, through apmff.com and Ticketmaster. In early 1977, not quite done with the lawsuit that had been keeping him out of the recording studio for his Born to Run follow-up, Bruce Springsteen and the E Street Band kept the shows rolling in February and March. A spectacular if undersung run of concerts, debuting unreleased cuts like "Action in the Streets" and "Don't Look Back," we can only hope '77 gets a little love from the Live Archive series. 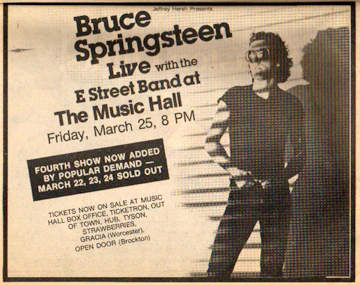 Forty years ago, Bruce and the band were in the midst of that tour's legendary closing stand — four shows in four nights — at Boston's Music Hall, March 22-25. 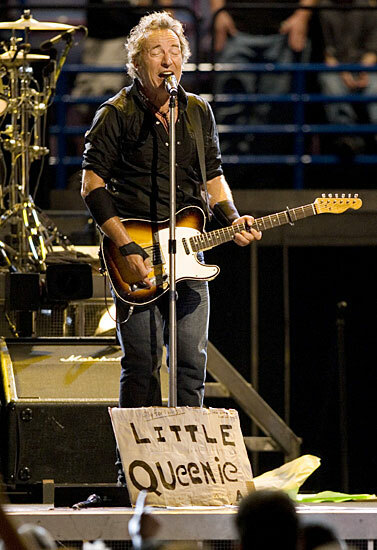 With the end of the lawsuit in sight, the E Street premiere of covers "Little Latin Lupe Lu" and "Higher and Higher," and of course the Miami Horns in tow, these performances are still considered some of Springsteen's greatest. Photographer and longtime Friend of Backstreets PJay Plutzer was there for three out of the four and shares these images with us. Just Before the Dawn, a new documentary focusing on the Upstage Club and Asbury Park in the '70s, will premiere at the Asbury Park Music and Film Fest in April. As you can see above, the film includes interviews with numerous musicians from the scene, including Southside Johnny and E Streeters Garry Tallent, David Sancious, and Vini Lopez. The trailer also reveals the doc to be about more than just the music or the mecca that was the Upstage, with the "troubled times" Springsteen alluded to in "My Hometown" — and specifically the town's 1970 riots — crucial to the story. "When we started making Just Before the Dawn, we thought we were making a film about a single place, the Upstage, and the young kids who played there and went on to stardom," says director Tom Jones. "What we found was so much more... a story that affects all of us about a town that has learned some hard lessons and has something to tell the rest of us about hope, strength and our future." Jones will be there for the world premiere of his film on Friday, April 21, at the Asbury boardwalk's Paramount Theatre, taking questions after the screening. The night will conclude with an all-star jam session to include E Streeters Sancious, Lopez, and Ernest "Boom" Carter, along with Sonny Kenn, Ricky DeSarno, Joe Petillo, Richard Blackwell, Albee Tellone, Chris Plunkett, Paul Whistler, Billy Ryan, Gerry Carboy, Tommy Labella and the Lakehouse Jr. Pros. 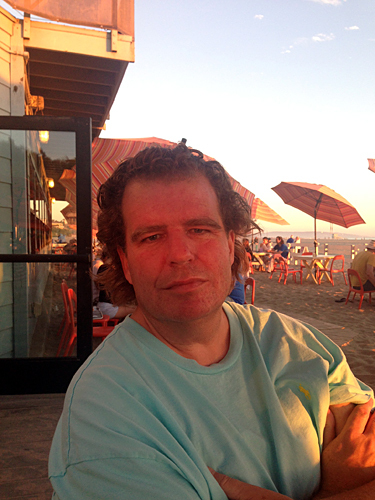 Jeff Kazee, current member of the Asbury Jukes, will serve as the night's music director. Tickets are available now. MORELLO BACKS BERRY ON "BIG BOYS"
The late, great Chuck Berry's final album, and his first since 1979, will be released posthumously by Dualtone Records on June 16. Simply titled Chuck, the 10-track release features sometime E Streeter Tom Morello guesting on "Big Boys," unveiled today (listen above). As the L.A. Times reports, the new track is one of eight Berry wrote for the album, which was announced on his 90th birthday last fall. According to a family statement, "Working to prepare the release of this record in recent months and in fact over the last several years brought Chuck a great sense of joy and satisfaction." 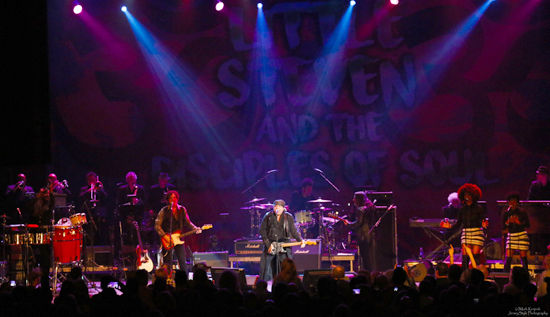 The U.S. gets its first peek at Little Steven and his band's "rebirth"
On Saturday night, the 21st-century version of Little Steven & The Disciples of Soul made its U.S. debut. The band's special headliner performance at the 2017 Rock and Roll for Children benefit at The Fillmore in Silver Spring, MD followed its European (and world) debut last October at London's BluesFest 2016. As previously reported, both of these "one-night-only" shows precede a planned full-scale European/U.S. tour, as well as the release of a new album, Soulfire, coming later this year. While it's been far too long since we've gotten to enjoy all that Stevie Van Zandt has to offer as a solo artist, bandleader and live performer, I am very happy to report that it has been well worth the wait. Saturday night's show fully confirmed that a very special record and concert tour is indeed headed our way. 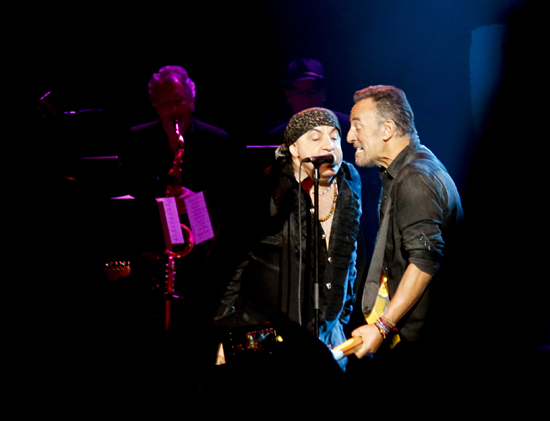 The show opened with a performance of the upcoming album's title track, "Soulfire," a song that Little Steven co-wrote with Anders Bruus of Denmark's The Breakers (their version of the song was produced by Van Zandt and released in 2011 on his Wicked Cool Records label). It took very little time to see and hear just how radically Little Steven and his fifteen-member band (including two special "guest Disciples": former Asbury Juke and ex-Blackheart Rock and Roll Hall of Famer Ricky Byrd along with Christine Ohlman of the Saturday Night Live Band, both of whom also performed earlier in the evening as part of The Rock and Roll For Children Foundation All Star Band) can transform a song like this into something much more expansive and downright awesome than even The Breakers' already excellent version. Having such a... well, soulful five-member horn section (featuring original Disciples of Soul Stan Harrison and Eddie Manion) and a trio of great backup singers (including Ohlman) helped much, of course. 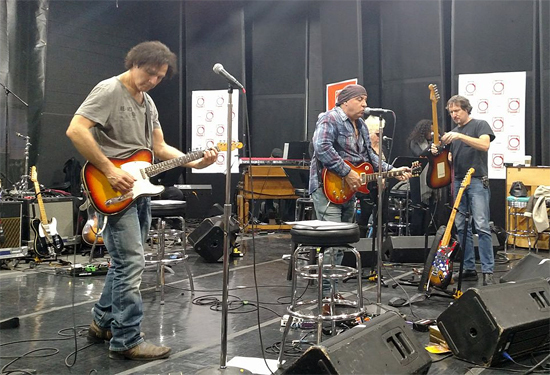 The key ingredient, however, remains Little Steven himself, a fact that should come as no surprise to any longtime Van Zandt fans who know and love his skills as a songwriter, arranger, guitarist, and vocalist. With the exception of a few smartly chosen and highly appropriate covers, all of the material performed on Saturday was written or co-written by Steve. His personal connection to these songs serves as the glue that holds together a show and an upcoming album consisting of a wide variety of material written for and originally recorded by such different artists over the years. Other Van Zandt compositions we got to hear on Saturday were originally recorded from the 1970s all the way through the 2000s by artists as diverse as Jimmy Barnes ("Ride the Night Away," co-written with Steve Jordan,) Gary U.S. Bonds ("Standing in the Line of Fire," co-written with Bonds,) The Cocktail Slippers ("St. Valentine's Day") and Southside Johnny & the Asbury Jukes ("Coming Back," "I Don't Want to Go Home," "Some Things Just Don't Change," and "Love on the Wrong Side of Town," the last of which was co-written with Bruce Springsteen). We also got to hear two great Van Zandt songs written for and recorded by the original early-1980s incarnation of the Disciples of Soul: "Until the Good Is Gone" and "Forever." Yet this project definitely is not an attempt to relive past glories. It's clear that Van Zandt and his collaborators, especially musical director and guitarist Marc Ribler, have worked very hard and successfully to reshape all of this material into something different and fresh, based on distinct and modern Disciples of Soul musical approaches. There's also great lyrical unity across these songs. Taken together in one setting, they allow you to experience all of the continuity, depth and breadth of Steven's lyrical vision: one that is well aware of pain and heartbreak, but refuses to give in to despair and instead embraces joy, love and a hard-bitten but hopeful belief that the world still can be made much better than it is now. Saturday's show was somewhat shorter than the October show in London, most likely to better accommodate the triple-act bill of the Rock and Roll for Children benefit, but we still were treated to performances of two Van Zandt compositions that London didn't get. Both of them were major highlights of the show. 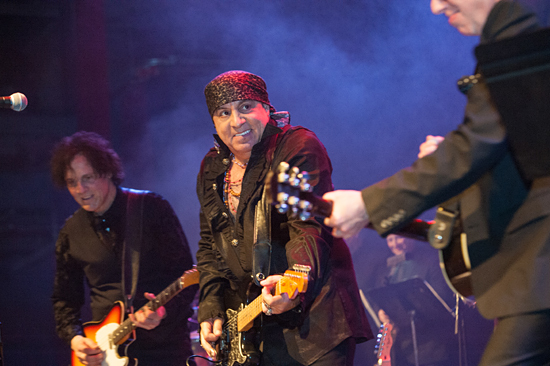 The first, "Standing in the Line of Fire," allowed Little Steven to display once again his immense creativity as an arranger. This new Disciples of Soul version combines elements of Steve's score for Lilyhammer with the more familiar rock and soul elements of the song. The pleasingly unique result, as Van Zandt himself noted from the stage, is "Gary U.S. Bonds meets Ennio Morricone." The other Little Steven composition, "The City Weeps Tonight," had never before been performed in public by anyone, let alone Steve. He told the audience that it originally was slated to be the first song on his first solo album. "I was gonna write the history of rock 'n' roll," he said, "but then I went political for a while... lost my mind. Feelin' much better now." Then the main person responsible for "Sun City," one of the most successful mergers (if not the most successful merger) of popular music and politics, paused for a few seconds. "Except... just when I thought I was out, somebody might be pullin' me back in." Many cheers erupted from the crowd, in a venue just a stone's throw from Washington, D.C. Stevie laughed and then quickly added, "Not tonight, though... just love songs tonight." What followed was a beautiful doo-wop-styled love song that Steve just nailed. He also talked a bit more about his love of doo-wop music and how his Underground Garage terrestrial- and satellite-radio project remains the only place where you still can hear doo-wop played regularly on the radio. In fact, Stevie's role as founder and chief proprietor of The Underground Garage, as well as the main force behind the Rock and Roll Forever Foundation, shone throughout the evening as he drew many important historical connections between the songs that he and his band were playing. Just a few hours after Chuck Berry's passing had been announced to the world, Steve dedicated the evening's performance to Berry. Before performing a tasty cover of Etta James' minor latter-day hit "The Blues Is My Business," he reminded us that James was a labelmate of Berry's at legendary Chess Records and spoke of the important role that Muddy Waters played in bringing Berry to Chess. Later he noted the impact of 1970s Blaxploitation films on popular music before performing his version of James Brown's hit "Down and Out in New York City" from the soundtrack of Black Caesar. And when he performed the night's penultimate number, a cover of Marvin Gaye's 1963 Holland-Dozier-Holland classic "Can I Get a Witness," Stevie hilariously vamped it up about how it was "so good to be in your beautiful city tonight" a la Solomon Burke in his 1964 sound-alike hit "Everybody Needs Somebody to Love." The final song of the show was something special "for Chuck," as promised onstage earlier in the evening: a beautifully appropriate and rockin' cover of "Bye Bye Johnny," Berry's lesser-known sequel to "Johnny B. Goode" about the guitar-slinger's rock 'n' roll dreams finally coming true. Back in the 1980s, of course, Bruce Springsteen sampled some of Chuck's lyrics and created his own "Johnny Bye Bye" as a mournful meditation on Elvis Presley and the tragedy of rock 'n' roll dreams destroyed. On Saturday night, however, it was all about celebrating the virtues of living a long, meaningful life, creating and appreciating music for the ages, and making our best rock 'n' soul dreams come true. After all, Little Steven and the Disciples of Soul are back, baby, and you are gonna love what they have in store for you. Hold on, they're comin'! "Bruce Springsteen has had an illustrious career spanning over 40 years of unforgettable cultural achievements. 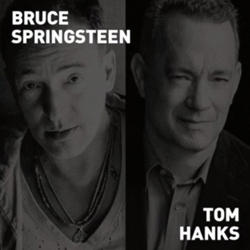 The musician sits down with celebrated actor and longtime friend Tom Hanks to discuss Springsteen's unique place in American musical history and look forward to the future." Click here for further info; tickets go on sale at 10am Eastern today, Tuesday, March 21, through Ticketmaster via tribecafilm.com. An exemplary forerunner of Bruce Springsteen's current Live Archive series, Hammersmith Odeon, London '75 was liberated from the vaults back in 2005. Capturing Springsteen and the E Street Band's first show outside of North America, on a quick overseas jaunt for Born to Run in 1975, it was initially released as a concert film included with the Born to Run 30th Anniversary box set. You likely already have it in that format, and/or the 2CD audio release that followed in 2006. 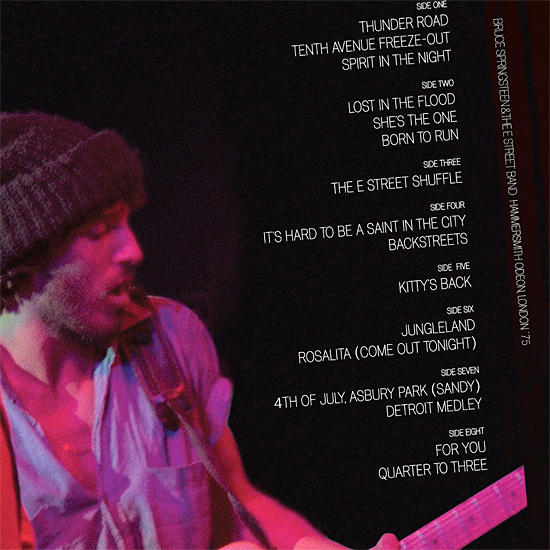 But this year's Record Store Day offering from Springsteen will be a treat for those with active turntables: Hammersmith is the first live album from Springsteen to be issued on vinyl since 2001's Live in New York City. The vinyl edition of Hammersmith Odeon, London '75 will be available from participating independent shops on Record Store Day 2017, in a numbered first run. It's a four-LP set — so don't expect it to be cheap — with the album's 16 songs spread over eight sides of wax (the sprawling, 17-minute "Kitty's Back" takes up an entire side). Later that evening an E Street Band, with a good deal of the carnival still in it and armed with a set list I still dare any young band to match, strode onto the stage of the Hammersmith Odeon. The tempos were fast. A Jersey stew of almost punk soul, fueled by the visionary songwriters, '60s records, garage bands, and Rhythm and Blues we loved. For me, the set went by like a freight train. Later, all I remember is an awkward record company party, that "what just happened?" feeling, and thinking we hadn't played that well. I was wrong. With the keys to the kingdom dangling in front of us and the knife at our neck, we'd gone for broke. Whatever happened, it became one of our "legendary" performances, marked only in memory, bits of bootleg tape, and "I was there when" stories. It was the show that put us on the map in England and began a long and beautiful relationship with our fans overseas. The performance, captured on this set in its entirety, was filmed on 16mm and recorded to 24-track on November 18, 1975. The audio was mixed by Bob Clearmountain and mastered by Bob Ludwig. Record Store Day is April 22. It's not accidental that Bruce Springsteen and Chuck Berry both have songs with the words "Promised Land" in their titles. Berry, who died on Saturday at the age of 90, was a rock 'n' roll pioneer, a true singer-songwriter who employed devices of cadence and rhythm differently than his peers, who pragmatically seized on subjects he felt everyone could relate to, but told stories within his songs. His music would become a clarion call across oceans and continents, to become part of the definition of rock 'n' roll. As Bruce says in Hail Hail Rock and Roll, the 1986 documentary about Berry, "I think I learned my first Chuck Berry riff from Keith Richards." In that way, he's like many of us who also came to Chuck Berry through the interpretations of the various members of the British Invasion. As Bruce says in Born to Run, "The Rolling Stones breathed punk life into Chuck Berry's greatest hits…." Bruce, along with Bob Dylan, would also be influenced by Berry's lyricism. "I think that his influence on my own writing came out more later on, when I wanted to write the way I thought people talked, because that's how I felt he writes," Bruce shared in the '86 documentary. Singing two lines of "Nadine," he continued, "I'd never seen a coffee-colored Cadillac, but I know exactly what one looks like." 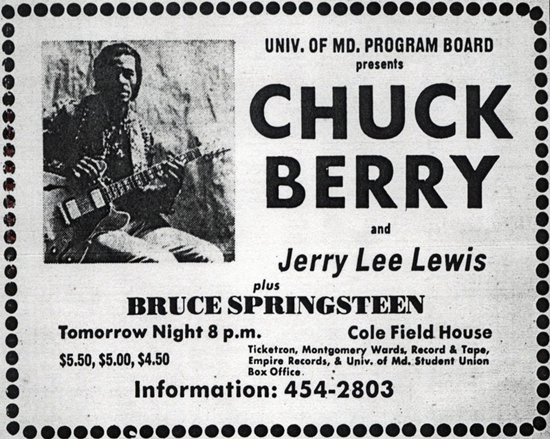 Bruce and the band would back Chuck Berry twice: once, in 1973, on a bill where they opened for and then backed both Jerry Lee Lewis and Chuck Berry (a sadder phrase has rarely been read than the line "Sadly there is no known audio of this show" in Brucebase), and of course in 1995, at the opening of the Rock and Roll Hall of Fame in Cleveland, when Bruce and E Street (along with other guest musicians) backed up, once again, both Jerry Lee Lewis and Chuck Berry. While Bruce has related the typically off-the-cuff experience of supporting Berry in 1973 — Chuck was well-known at this point for touring solo and requiring the promoter to supply a backing band — one would have thought the circumstances would have been different more than 20 years later, with Bruce's considerable success behind him. This, unfortunately, was not the case, as Nils Lofgren related in an interview for the RRHOF: "Somehow, a minute or two in, he… shifts the song in gears and a key without talking to us," Lofgren says. "Now, we all… okay, we're pros, right? So, we're all like… trying not to make a train wreck, and it's tricky. Okay, what key is he in? Let's start playing there." Despite the years of experience assembled onstage, things did not improve. 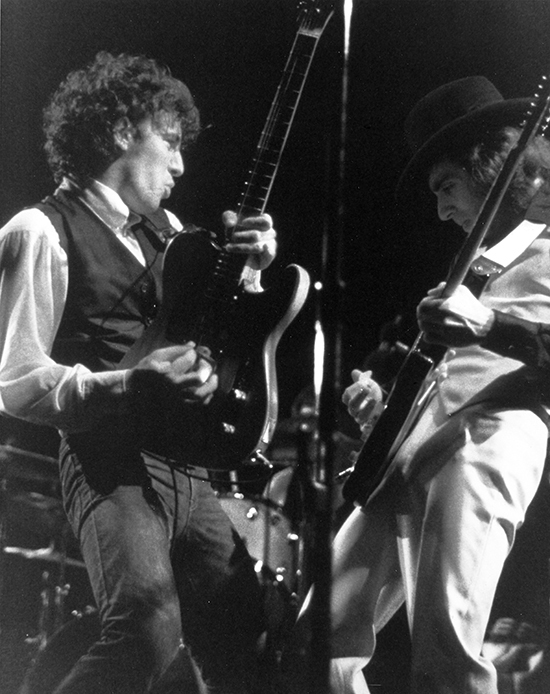 "At the height of it, when no one has any idea how to fix this, Chuck looks at us all and starts… looking at us, duck-walking off the stage, away from us," Lofgren said. "He leaves the stage, leaves us all out there playing in six different keys with no band leader, gets in the car and drives away." NO MONEY DOWN: Tempe, AZ, November 5, 1980. Utilized about half a dozen times as an intro to "Cadillac Ranch" on the River tour. LITTLE QUEENIE: St. Louis, 8/23/08 - I believe the correct word should be "incendiary." Of course, there are many more to enjoy through the magic of bootlegging. On Saturday, Bruce offered this statement on brucespringsteen.net: "Chuck Berry was rock's greatest practitioner, guitarist, and the greatest pure rock 'n' roll writer who ever lived. This is a tremendous loss of a giant for the ages." Little Steven writes: "Chuck Berry was the King of Rock and Roll. Period. Richard brought the Passion, Elvis the Heartbreak, Bo the Beat, Jerry Lee the Abandon, Buddy let the Everyman in, Chuck brought the Storytelling. The words that Bob Dylan would evolve into an Artform. He led the teenage takeover of Pop Music that the Beatles and Stones would complete. He invented Rock guitar and made it look like fun. He gave the previously ignored age group between adolescence and adulthood an identity, a mythology, a chance to see themselves. He gave them Respect. And those teenagers would return that respect to Rock and Roll for the next 60 years and counting." With the news coming last night that we'd lost rock 'n' roll founding father Chuck Berry, Little Steven closed his first U.S. performance with the Disciples of Soul since the '80s with Berry's "Bye Bye Johnny." Thanks to DJ Rich Russo for the video. Springsteen also offered his thoughts on this "tremendous loss." More to come on all fronts. This is a tremendous loss of a giant for the ages. 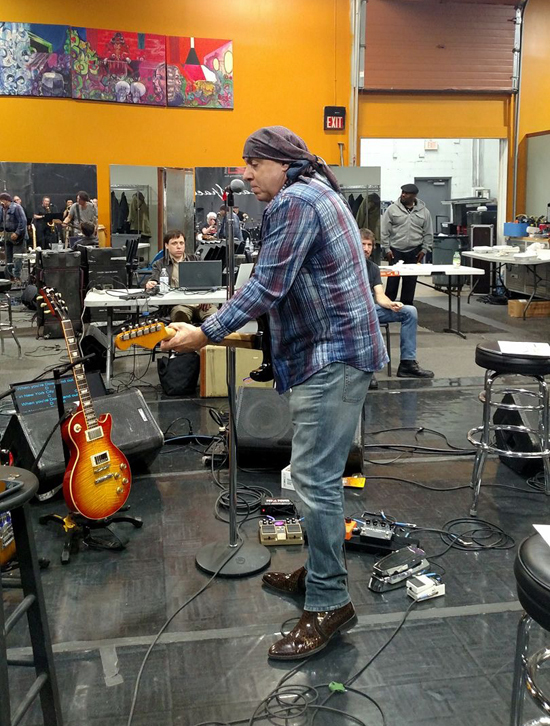 Stevie Van Zandt and his new Disciples of Soul, rehearsing in Maryland for tonight's U.S. return, the Rock and Roll for Children benefit in Silver Spring. 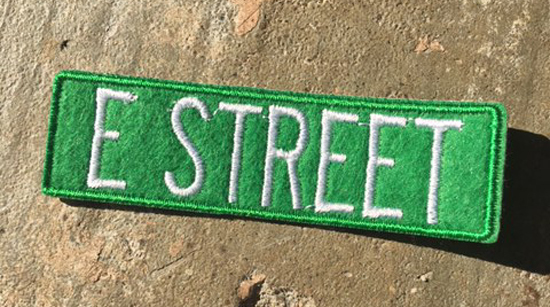 Today's a good day to pick up the latest Boss offering from our friends at printmafia.net — this green E Street patch, three-inch embroidered felt which can be ironed or sewn on to the duds of your choice. It's another in their line of E Street Nation signage, also including an E Street keychain and enamel pin, and a frozen-out 10th Avenue pin, too. 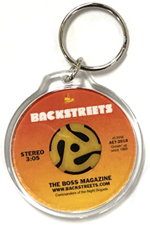 If you like the looks of those, Print Mafia also custom-made a few such goodies for us — check out the Backstreets keychain and enamel pin in our own online shop, and order both together to save some dough. BEER FLOWS THROUGH THE FAUCETS... HAPPY ST. PATRICK'S DAY! A year ago today: "American Land" at the L.A. Sports Arena. Though the "immigrant song" returned to a prime spot in the E Street Band set for very different reasons in 2017, this was its only performance on the entire 2016 River Tour, a St. Patrick's Day special. 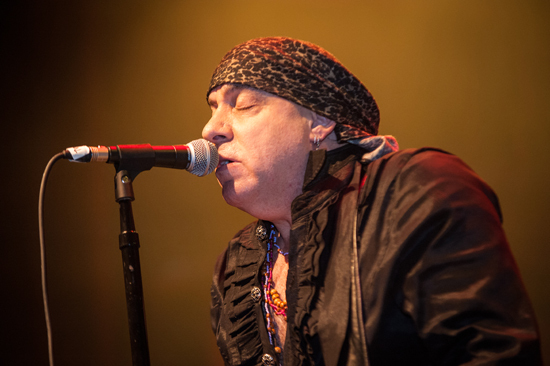 With the E Street Band on hiatus for the foreseeable future, Little Steven is now turning his attention to his long-abandoned solo career, with a new album coming this year and live dates with the Disciples of Soul on both sides of the Atlantic over the next few months, following on from his London concert last October. "I haven't visited The Artist Formerly Known As Little Steven for a long time," he recently told DC-area station WTOP. "It's probably been 15 or 20 years since I toured or put out something of my own, so this is a rebirth and I'm gonna keep it together. I'm gonna continue to be touring. When the E Street Band's not touring, I will. We'll alternate between the band and solo. It's wonderful to have both things going. You can express yourself on the one hand, and then do the E Street thing, which has become such an institution now. Nothing quite like it." First on the agenda is a show with the Disciples of Soul this Saturday at The Fillmore in Silver Spring, Maryland (north of Washington, DC). 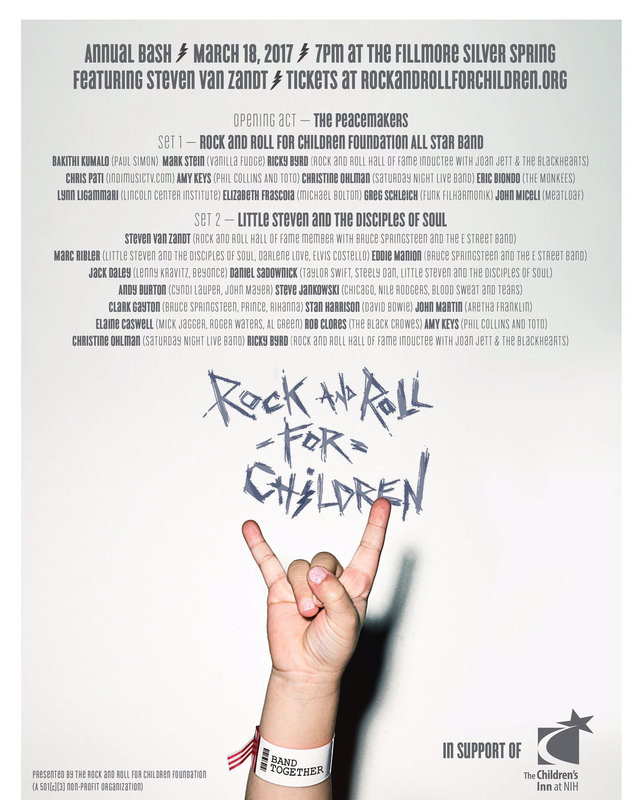 The March 18 performance will be the centerpiece of the annual Rock and Roll for Children concert, a benefit for the Children's Inn at the National Institutes of Health. Following a memorabilia auction and a set by opening act The Peacemakers, the first half of the show will feature the Rock and Roll for Children Foundation All Star Band. Another once-only line-up of the Disciples of Soul (which borrows several members of the all-star band) will then take to the stage for the second half. 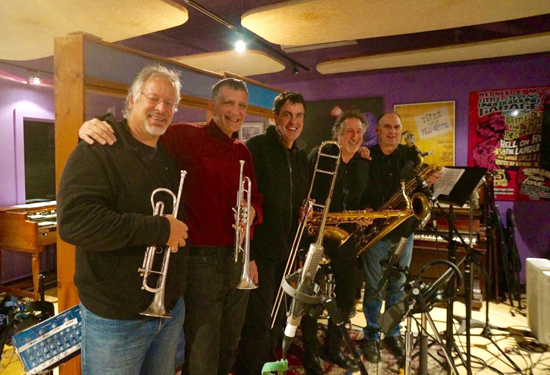 While Marc Ribler (guitar and musical director), Ed Manion (baritone sax and horn section leader), Andy Burton (organ), Danny Sadownick (percussion) and Jack Daley (bass) remain from the London show, the advertised 14-piece line-up will include Asbury Jukes alumni Rob Clores (keyboards), Ricky Byrd (guitar) and Stan Harrison (tenor sax), Sessions Band trombonist Clark Gayton, plus Steve Jankowski (trumpet), John Martin (drums) and backing singers Elaine Caswell, Amy Keys and Christine Ohlman. 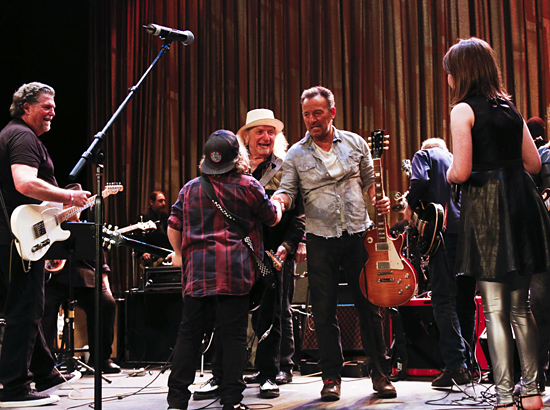 "It's extremely important to support what the National Institutes of Health and Rock and Roll for Children are doing," said Little Steven. "You can't do enough for kids and this is one of the best in the country. They take special care and it's run very well. Friends of mine have been doing it for years and they're very happy with everybody, so they got me involved. That alone is a good enough reason to come, but we always put on a good show. There's gonna be great music all night long. It's an entertaining show for a very good cause. What's better than that?" "By paying for a ticket, you'll be helping the cause and be witnessing some amazing music by some of the world's best musicians. It's a win-win all around," echoed Marc Ribler. Although touring plans are still taking shape, it's apparent that the initial focus will be on Europe, with U.S. dates tentatively set to take place in September. Eight European appearances have been announced so far, spread throughout the summer, with more to follow. Little Steven said that he was "still waiting for details" but that a full itinerary would appear on Facebook "as soon as we have it." Fan inquiries about dates in London, Dublin and elsewhere have been met with the usual response of "working on it." A suggestion that the tour may consist of two parts (June and August) may no longer apply, given that there are now shows in July. 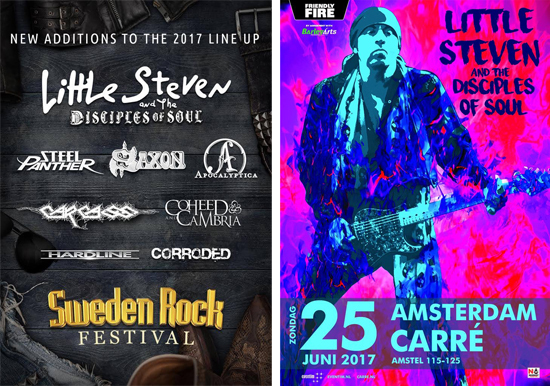 The majority of the confirmed dates are festival bookings, but a notable exception is the appearance at the historic Theater Carre in Amsterdam (capacity approximately 2,000) on Sunday, June 25. Originally booked to take place on Saturday, June 24, the show was moved back one day to avoid clashing with a concert by Southside Johnny and the Asbury Jukes at the nearby Paradiso. Although their respective travel plans may prevent it, the potential for guest appearances at one or both of the shows is hard to ignore. Either way, it promises to be a memorable weekend for followers of two of New Jersey's finest musical exports. Recorded between Halloween and Christmas last year and originally rumored for release in May, the new album Soul Fire has now been delayed until after the European tour. "Looks like September," said Little Steven recently, "not sure yet, it'll be announced eventually." Although the track list is yet to be revealed, we know that the record is not a collection of newly-written material. Instead, it largely comprises recordings of songs written for other artists over the past 40 years. 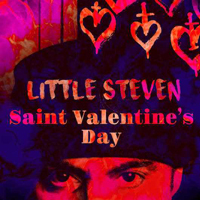 "The album is basically me covering me," said Little Steven. "I'm doing songs I've written for Southside Johnny, Gary US Bonds, Jimmy Barnes in Australia, groups in Europe like the Breakers and Cocktail Slippers. I put one blues thing on the record. I also have a James Brown song." This suggests that Van Zandt originals like "I Don't Want to Go Home," "Trapped Again" and "Ride the Night Away," and covers of "The Blues Is My Business" and "Down And Out in New York City" (all played in London) may be included, but that's pure speculation at this point. The first song to see the light of day from the 2016 sessions was "Saint Valentine's Day," appropriately released on February 14. 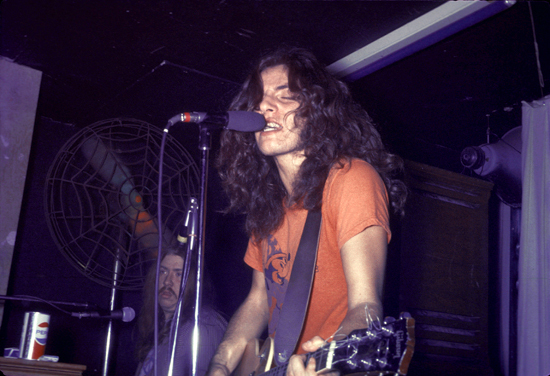 (Check out our news archive for Shawn Poole's full report on the song's previous incarnations). It's a five-minute prime cut of Jersey Shore rock and soul, with infectious horn riffs, powerful drum fills, strings, female backing vocals, irresistible hooks and insistent rhythms, powered by the Van Zandt work ethic and wrapped up in a modern-day Spectorian production. Thrilling stuff, and Little Steven promises that "there'll be tracks escaping now and then in the meantime" until the album is finally released. Fans attending the Silver Spring concert will be the first to hear the majority (if not the entirety) of the new record performed live. "It's not going to be out for a little while, but this is going to be the first preview of it," said Little Steven. "So that's really quite something special, I think. It's going to be the debut performance for whoever's there." Those who have already heard the album or took part in the sessions have reacted enthusiastically on social media. Steven's wife Maureen said, "You may think I'm biased, but I tell it like it is. And it is FAB. There will be soul. And dancing." Ed Manion added that "recording this album was a joy," and co-producer Marc Ribler said that he felt proud and honored to have worked on "what I feel many will agree is one of the finest albums to be released in this decade, if not this millennium." Bring it on! For the 30th anniversary of Roy Orbison & Friends' Black and White Night, Roy's Boys went back and recut the entire concert special, revisiting the original footage from five cameras for a brand new edit. Online, they've made all five angles available for a complete song — it's an "interactive experience" of "Oh, Pretty Woman" from that 1987 performance, with Orbison backed by Bruce Springsteen, Elvis Costello, Tom Waits, Bonnie Raitt, Jackson Browne, and more. You can pick cameras on the fly to watch your own edit. See all five angles in HD here. Black & White Night 30 is available now from Backstreet Records, on CD/DVD or CD/Blu-ray. For a taste of the extensive bonus features, you can also watch a clip of the artists talking about Orbison, as well as footage of Bruce and Roy working out vocal harmonies, at Vevo.com. MIGHTY MAX: "I FEEL A THOUSAND PERCENT GREAT"
This week, Rolling Stone ran a post-tour interview with Mighty Max Weinberg, back home from New Zealand but still fired up and ready to go: "If Bruce called today and said, 'We're going to do another six months,' I would have let out a yell of exultation." Max spoke with Andy Greene about the past year of E Street touring, as well as recent major surgeries ("I'm here to report that I feel a thousand percent great"), leading his own bands, and his son Jay's career in Slipknot: "Two years in a row he's been named the best metal drummer out there." As for E Street, Max has "no idea" when they might play again, but, he says, "I don't think anyone walks away from any of these shows we did in the last six weeks and thinks, 'Guys, it's time to hang it up.' I think we're breaking new ground. I think we're like the old bluesmen that just keep playing. What else are you going to do?" Eric Meola once suggested to Bruce Springsteen that he shoot a portrait of him and his father, only to be met with a look that killed that idea immediately. Danny Clinch once watched his father head off with Bruce for a drive around Asbury Park, before he could grab his camera and go along. Barry Schneier's now-historical images of the Springsteen show at the Harvard Square Theater in Boston would have been sitting in a box forever, were it not for his children asking about his concert pictures and Boston.com's photography contest. Ed Gallucci used to buy film in bulk and wind his own canisters to save money, until he went to shoot Bruce at Kenny's Castaways, only to discover that a mis-wound camera sprocket caused him to walk out with only five images. And Frank Stefanko's classic image of Bruce sitting on the front of his Corvette in the snow, the number one-selling image at Morrison Gallery and now indelibly linked with Springsteen forever as the cover image of his biography? It was an afterthought, almost; Stefanko only shot one frame. All of the photographers started their careers in the era of physical film, a time when you dealt with the limitations of 36 frames to a roll, as well as having to wait to get to a darkroom to process negatives and generate a contact sheet in order to see if they'd gotten that one image they'd seen through the viewfinder. 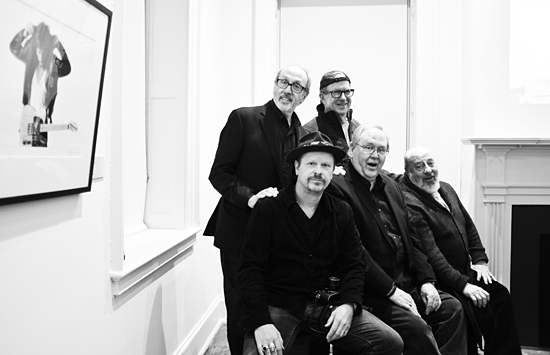 Each of them waxed rhapsodically at some point in the afternoon about their favorite brand of film, now extinct, from a not-so-distant past when the phrase "I shot Tri-X pushed to 800" was the common lingo of the live concert photographer. Ed Gallucci told of the difficulties of having a very Italian name in the '70s, only to arrive at Kenny's Castaways and see "Bruce Springstein" on the awning. "I thought, here's a guy who's proud of his heritage." He made $15 per photograph back then and was very happy to do so. Barry Schneier relayed his story of getting to know the local promoters in Boston and becoming the guy they turned to as their house photographer. A friend suggested one day that they go to a bar called Charlie's Place to check out a new artist. Barry was blown away, calling his promoter contacts and insisting that they had to listen to this guy, loaning them his albums. "My first reaction was, 'I'm never going to see those records again,' because in those days, when you shared music, you physically gave an album to someone and hoped you saw it again," Schneier remembered. Those promoters were also Bonnie Raitt's managers, and this was how Bruce ended up opening for Bonnie Raitt at the Harvard Square Theater in 1974. Eric Meola began his retelling of how he came to shoot the cover of Born to Run by noting, "When this all happened, Bruce wasn't Bruce yet, the way we know, and I wasn't Eric at that point. I was working on my own career." Meola lived around the corner from Max's Kansas City in 1973, and he walked by one day and saw Bruce's name on the marquee. "I had heard the first two albums and decided immediately I was going to go see the show that night." After he saw Springsteen play, Meola had a new goal: "I'm going to follow him around. I'm going to photograph him." A year would go by before Meola would see him again, at Wollman Rink in Central Park. "I went up to Central Park and it started raining, and I ran under the awning, and who should be standing there but Bruce. I didn't know what to say, I don't really remember what I said; I went up and asked him about some of the lyrics, because some of the lyrics were hard to understand on the second album, and the second album didn't have the lyrics printed on the back. And we talked for a while. The next month I drove down to Red Bank, New Jersey, and I saw him in Red Bank. I got there a few hours early, and Bruce walks in, and we start talking again. So little by little, I got to know him." The months went by, and Meola kept in touch with then-manager Mike Appel, and "Clarence put in a good word for me." But they kept cancelling on Meola. "There was part of me that realized, this was going to be it. Either I got this or I didn't get it, because they were really busy. I had no idea if other photographs had been taken, and I finally said to Mike, 'Look, you've cancelled six times on me. You've got to get him to come in.'" Meola continued: "I decided to shoot in the studio, rather than try to do something at his house, or outdoors, because I wanted to have total control of the light. My background at the time was advertising photography, and I looked at this as a job, in the sense that I had a job to do: I had to come out with the greatest photograph possible for the album cover. I really wanted to get the cover of that album." "So they came in, right on time, 11 o'clock in the morning. I got two hours, I shot 700 or 800 photographs. I only had one mantra at the time: 'Shoot as much as you can.' Try as many poses, as many changes of clothing. I'd also scouted some locations around the corner with a fire escape. The idea was that I wanted to give the art director as many possible choices for the album cover... I put on the Rolling Stones, I put on Van Morrison, and we just shot very, very quickly, and the rest was history." "I was just kind of a kid with a camera," Frank Stefanko began, "It was something I had been doing since I was very young." He related that his introduction to Bruce's music came from the radio, via the great Philadelphia DJ's Ed Sciaky and David Dye, both early Springsteen boosters. Stefanko said his reaction was, "I know this guy. I don't know him, but I know him. He's Jersey, and, hell, we could be brothers. So I told my friend Patti Smith, 'You gotta look out for this guy Bruce Springsteen, I think he's really going somewhere.' And as fate would have it, Bruce showed up at a concert Patti was doing at the Bottom Line, and Patti said, 'You're going to be famous some day — my friend Frank from South Jersey said so.' So that was kind of it. Shortly after that I received an album in the mail, and it was Bruce's first album, Greetings From Asbury Park. And in those days, the postcard actually opened up, and on the back of the postcard it said, 'To Frank: My biggest fan. Patti says.' Signed, 'Bruce Springsteen.'" Later on, Stefanko related, "Bruce had seen some of the work I had done with Patti Smith, and he felt that maybe there was a shot there, and he called me up and said, as he always does (imitating Bruce): 'Hey, Frankie! Let's get together and do some photos and have some fun.' So he came down to my house, and it was the beginning of quite a few sessions. We just shot randomly, in Haddonfield, NJ, in my house, outside my house, down the street, where people said, 'Is that…? No, couldn't be.'" "Unlike some situations now, because Bruce's time is so valuable, in those days, we had the luxury of time. And so like Eric (Meola) said, shooting 700, 800 shots, we just shot away, and you hoped you had something good in there. And so, we shot; went up to New York, we shot; and then you just sit there and you wait. And one day, I got a call and (Bruce imitation again): 'Hey Frankie, you got the cover for Darkness, front, back and inner-sleeve.' And that was the beginning of three album covers now. That's how that started." 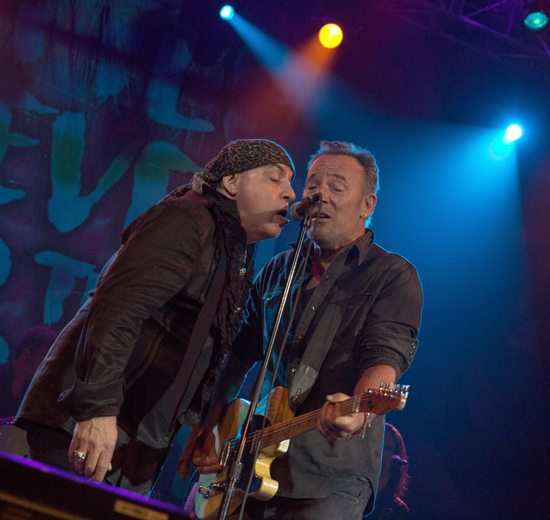 "I would often go to the Stone Pony, hoping I would see him," Danny Clinch shared, "And I saw many really great shows at the Stone Pony... without Bruce there." He continued, telling the story of splitting up his camera, film, and lenses between his friends in order to sneak his equipment into concerts. 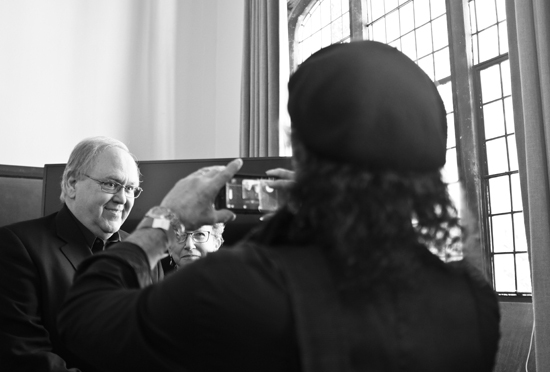 He believes that his first photograph of Bruce was from Amnesty International, onstage with Sting. "Bruce is one of the great collaborators," he continued. "He studies the history of rock 'n' roll, he's seen every pose that Elvis has given, and he's made some of them his own. And we've had that conversation before, he's like, 'I've spent many times in front of the mirror, working out my look.' So my goal is not only to accept what he's giving me, but also maybe to catch something that he's not giving me." Towards the end of the talk, Santelli asked each photographer to discuss one photograph from the exhibit. Stefanko discussed the image now known as "Corvette Winter," wondering why it was so popular. "Wait a minute: there's a house in the background. And there's a front porch in the background. And he's leaning by a car. Is it possible that this is Thunder Road incarnate?" 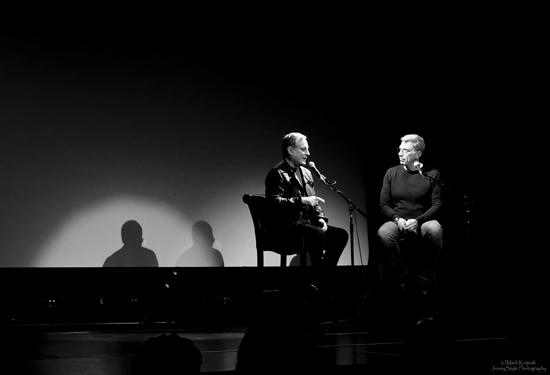 Barry Schneier talked about being at the Harvard Square Theater and shooting the band, and after a certain point deciding that he was done and going to sit down, only for Bruce to walk over to the piano and sit down right in front of Schneier. "My first thought was: 'I didn't know that he played piano.' My second thought was, 'I'm reloading my camera.'" Eric Meola decided to flip the question around: "I don't like so much to talk about the shots I got as much as the shots I didn't get." That was when he described the moment when he asked Bruce if he could take a photo of him with his father: "To be honest with you, I had no idea how I would photograph him, but I decided to broach the subject. And I asked him, and his face just went — down. I instantly got the impression that it was completely off-limits and wasn't going to happen." The second moment that got away from Meola took place at the start of their famous trip through the Utah desert in 1977: "I get to the airport and I'm looking around for Bruce, and I see him sitting on his suitcase. He's got the newspaper open, with a big headline on the front of the Daily News: 'ELVIS DEAD.' And I'm thinking, 'Wow. This is a great shot.' But no sooner did I see it than he happened to look up, he saw me, and I was not about to ask him to hold the newspaper up again." Ed Gallucci related the heartbreaking story of shooting an entire show with his hand-rolled film, only to discover his camera malfunction moments before the band ended their set, leaving him with only a handful of shots from his second camera. "When they called the second time, I bought the Tri-X in the box!" 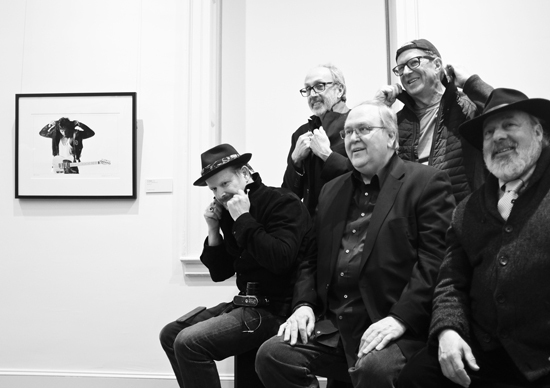 And Danny Clinch's nod was to his photograph of the band on the plane, coming back from the Buffalo show in 2009, describing that after he'd taken the photo, Bruce came on the plane PA system, making announcements as though he was a flight attendant. The event was a great afternoon of Springsteen oral history and photography history, with the only negative that it ended after 90 minutes. There are two other discussion panels planned to coordinate with the photography exhibit, including one with Tom Cunningham and David Dye — Bruce Springsteen on the Radio — on April 6. Sunday afternoon in Princeton, NJ, many of our favorite photographers — including Danny Clinch, Ed Gallucci, Eric Meola, Barry Schneier, Frank Stefanko, and Pamela Springsteen — will talk about their adventures photographing Bruce Springsteen over the years, dating back to 1972. 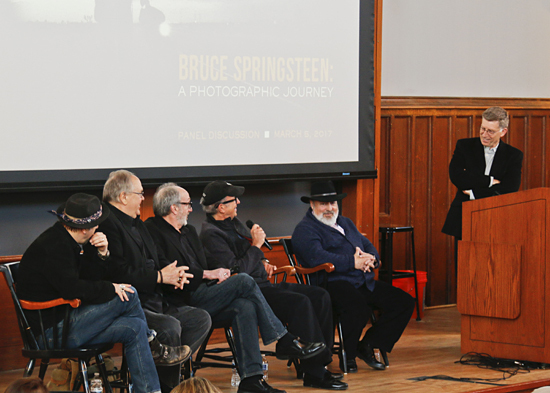 The March 5 panel discussion, moderated by Bob Santelli, is in conjunction with the GRAMMY Museum's traveling exhibition Bruce Springsteen: A Photographic Journey, currently on display at Princeton's Morven Museum. They've done this before over the course of the exhibit's travels, and it's a lively conversation. Get there if you can: Sunday, March 5, at 3pm. Click here for details and to purchase tickets. 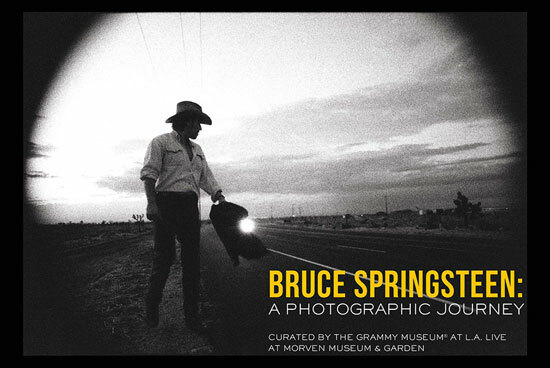 Morven Museum & Garden has the Bruce Springsteen: A Photographic Journey exhibit on view trough May 21, surveying Springsteen's career with 42 photographs as well as video interviews with the artists behind the cameras. 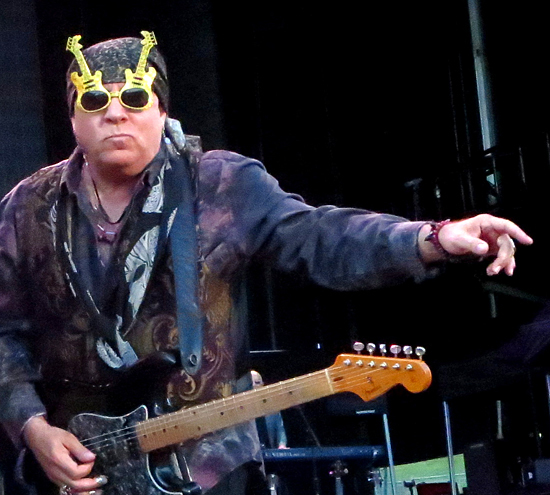 THROWBACK THURSDAY: RETURN OF "THE CHAMELEON"
Seeing Steven Van Zandt sport those rockin' shades a few days ago during "Glory Days," on the final night of the Summer '17 Tour, got us flashing back to 2014, right around this time of year. That was when Stevie finally revealed himself to be a true master of brilliant disguises: in a trio of hilarious television commercials for Norway-based telecommunications company Telenor, Van Zandt played "The Chameleon," a secret agent investigating the company. Not surprisingly, The Chameleon's stock-in-trade consisted of disguises, allowing us to see Little Steven as we've never seen him before. If you thought his role as Silvio Dante on The Sopranos was a transformation, you ain't seen nothin' yet. 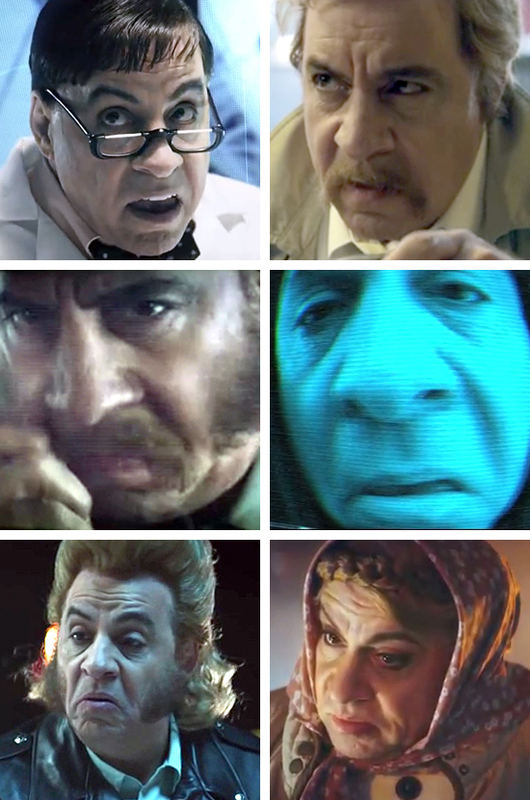 And here's a gallery of all of The Chameleon's undercover characters from the ad campaign — six mind-boggling looks in just over four minutes, baby! In 1976, 1977, and 1978, Southside Johnny and the Asbury Jukes released their first three albums on Epic Records, a string of stone Jersey Shore classics culminating with Hearts of Stone. 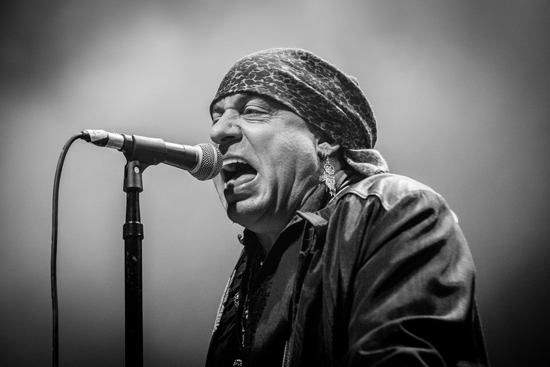 Steve Van Zandt and Bruce Springsteen famously contributed numerous songs for each record. 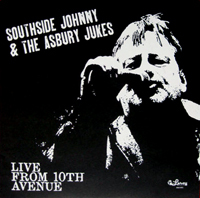 Along the way Southside and the Jukes also recorded a live album, Live at the Bottom Line, released at the time as a promotional-only LP. All four records were produced by Miami Steve. Now, all four have been remastered — for the first time since the dawn of the compact disc — and are available together on a two-disc anthology, dropping this Friday from Real Gone Music (officially licensed from Epic/Sony). The Fever: The Remastered Epic Recordings presents the four-album sequence, 40 tracks in all, remastered from the original tapes by Mark Wilder. Hard to believe this much great music fits in one jewelcase, music that means so much to us and probably means so much to you, too... and for a lower price than the Japanese Live at the Bottom Line CD alone used to command... but we won't argue. For further details and to order yours, check it out now in our online shop.